SUZOHAPP will be exhibiting at the brand new InterFun Expo. Taking place in Leeds, UK from April 30 to May 1, InterFun Expo offers an outstanding opportunity to network with amusement and leisure professionals - operators of FECs, play centres, arcades, amusement parks and visitor attractions. SUZOHAPP will be exhibiting at booth #42 and will be displaying the highlights from its portfolio of world-class products, including individual components as well as complete solutions. A wide range of components for amusement machines will be presented, such as coin and bill validators, hoppers, locks, pushbuttons, joysticks, speakers, monitors, plus a rich array of solutions from the BilliardPRO and CompetitionPRO product lines. "The main benefit we offer our customers is that we can simplify their sourcing by providing literally thousands of products and spares, along with the know-how and experience to advise them and ensure that our solutions match their expectations and aspirations," says Matt Luckhurst, Sales Director UK & Ireland. "With short lead times and competitive pricing as well, our customers save valuable time and money." For the full article, download the Press Release below. SUZOHAPP introduces VaultConnectTM, the latest addition to the popular CashCompleteTM software solution portfolio. VaultConnectTM brings offline cash storage into full view, allowing users to monitor their true cash positions and incorporate all available cash into daily operations. Currently, many retailers track funds stored in vaults separately from funds stored in cash recyclers and smart safes. VaultConnectTM allows users to pull all their cash-related data together using the CashCompleteTM Connect platform. Deposit and withdrawal information for vaults can be entered into any CashCompleteTM On-Device enabled machine, be it a standalone PC, cash recycler, or smart safe. Vault data is then available to view in the same way as recycler and smart safe data, clarifying cash positions across units and locations and maximizing the productivity of cash by supporting the daily operations of the business. By extending the visibility of cash, VaultConnectTM improves overall cash management within the organization. "We have our current CashCompleteTM customers to thank for the advent of VaultConnect?," says Christoffer Bergman, SUZOHAPP Vice President of Software Engineering. "They asked us to develop a way to account for all their cash within the CashComplete? environment, regardless of where the cash is located. VaultConnectTM is our answer." SUZOHAPP - will be exhibiting at the Feria Internacional del Juego that will take place in Madrid between 9-10 April. SUZOHAPP will be present at Booth #C18 in Hall 3 and will be showcasing a complete offering of components and solutions for Gaming, Amusement, Sports Betting, Lottery and Bingo. This includes coin and bill validators, LCD monitors, locks, pushbuttons, printers, scanners and more. 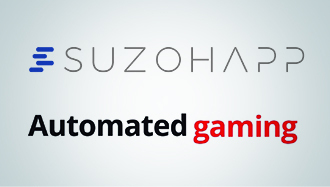 SUZOHAPP will be supported by Automated Gaming which is the new SUZOHAPP sales representative and service centre for the Spanish gaming market. "We are excited to be with SUZOHAPP at this year's Feria Internacional del Juego. We will display a portfolio of unique components and solutions that meets the demands of various gaming market segments," commented Genís Catà, CEO of Automated Gaming. "We are pleased that Automated Gaming will now be supporting us in Spain," said Goran Sovilj, SUZOHAPP's Executive Vice President of Gaming & Amusement in Europe. "They are a team of highly skilled professionals with years of experience and expertise. We see great opportunities in our partnership." SUZOHAPP - a global market leader in payment systems and cash management solutions - will be exhibiting at the upcoming Vending Paris, from April 2-4. SUZOHAPP will be present at Booth #B09 in Hall 2.2. and will be featuring a comprehensive offering of components for vending machines. This includes coin validators and recyclers, bill validators, cashless systems, LCD monitors, locks, pushbuttons, and more. "At this year's Vending Paris, we come with a simple message - simplify your sourcing," says Francois Profit, SUZOHAPP's Executive Vice President of Automated Services in Europe. "We have the ability to be a complete source for operators, as we can provide every single component that fits into a vending machine. Ours is the most complete offering in the vending industry." As major highlights, SUZOHAPP will be showcasing the ideal combination of payment systems for all vending machines: the Currenza C2 coin recycler, the Vantage banknote reader and the WorldKey cashless solution. These systems are the perfect payment trio as they guarantee maximum flexibility in payments and high transaction security.The WorldKey cashless range now includes the WorldKey Loyalty platform - an advanced online solution that allows operators to communicate directly with end users and increase their loyalty. A new additional feature of WorldKey Loyalty is the credit recharge of Mifare® media directly online, using a payment card. SUZOHAPP - a global market leader of software and hardware payment management solutions - launched its latest innovations in cash automation technology at its Product Launch Event held on February 20th at the Merkur Spiel-Arena in Düsseldorf. Guests from all around Europe witnessed the unveiling of two new revolutionary CashCompleteTM retail solutions - the Smart Deposit Solution, SDS-760 and the Smart Point of Sale Solution, SPS-700 & SPS-800. The event was a great success and the speakers' speeches were much appreciated by the audience. Wilbert Bieleman, SUZOHAPP President and General Manager for Europe, the Middle East and Africa (EMEA), welcomed the guests and gave an effective overview of the SUZOHAPP Group. Sim Bielak, SUZOHAPP's Chief Marketing Officer, unveiled the new innovations and highlighted their outstanding features and benefits. Dr. Rory Herriman, Executive Vice President and General Manager of SUZOHAPP Digital, explained the significance of cash in society and how the new CashCompleteTM innovations can help retailers optimize their cash management processes. A big highlight of his speech was the introduction of the new CashComplete? Connect - Retail EditionTM which delivers next-generation automation of retail payment management processes. SUZOHAPP reports a successful participation at the International Casino Exhibition (ICE) that took place between the 5th and 7th of February in London. The global SUZOHAPP team was kept very busy on all three days. A new booth position provided more room to display SUZOHAPP?s increased product offerings of components and solutions for Gaming, Amusement, Sports Betting, Lottery and Bingo. "The global gaming market is extremely diverse and we have so many solutions. We offer over 50,000 components alone which is why we purposely created the stand to help visitors find those components that would address their specific needs," explained Goran Sovilj, SUZOHAPP's Executive Vice President of Gaming & Amusement in Europe. Components of main interest that were on display were the range of LCD displays, including the latest VisionProTM Edge-Lit LED touch and non-touch monitors, and Elo Touch Solutions open frame monitors. Further key components were toppers, pushbuttons and LCD button decks, including the new DPS (Dynamic Panel Systems) as well as locks, including the new Giussani E-PRL reprogrammable electronic lock. The printers from Nanoptix and the barcode scanners from Newland were showcased on separate islands, underscoring the importance of these distribution products for SUZOHAPP. SUZOHAPP - a global market leader of software and hardware payment management solutions introduces an industry innovation that revolutionizes how payments are managed across the entirety of a retailer's enterprise - CashCompleteTM Connect - Retail EditionTM, the latest addition to the market leading CashCompleteTM Connect payment automation software suite. Built specifically for retail payments management, Retail EditionTM automates the entire retail payment process, from payment acquisition to reconciliation. Retail EditionTM provides real-time visibility, advanced analytics, reconciliation and general ledger integration. Using advanced analytics, Retail Edition? arms Retailers with timely and actionable information, resulting in optimized in-store and corporate accounting labor productivity, significantly reduced working capital and drastically improved cash shrink due to errors and theft. CashCompleteTM Connect - Retail EditionTM is already operating successfully in the field. One major retailer with hundreds of outlets and thousands of employees worldwide needed a reliable system to give complete visibility to and proactive management of its complex payment operations. After the implementation of Retail Edition?, this large retailer realized real-time cashier balancing, remote user management, and general ledger integration. 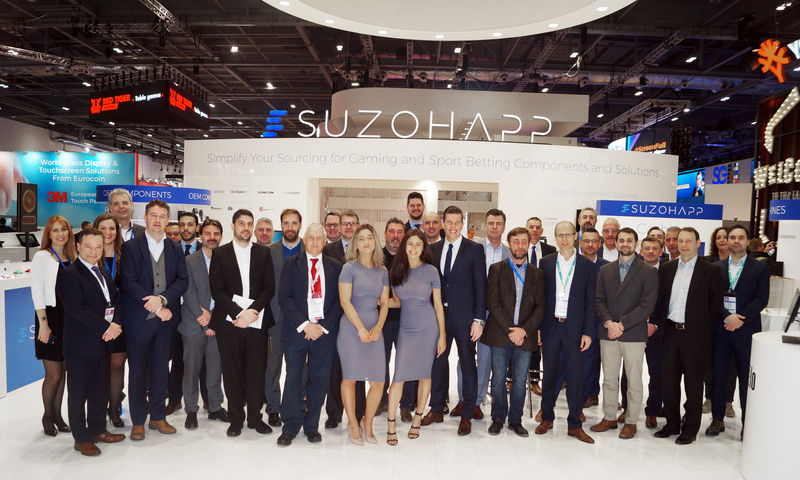 SUZOHAPP - a leading technology company with over 50,000 products for casino operators and gaming OEMs - will be exhibiting at the ICE in London from February 5-7. This year, SUZOHAPP has a new booth position (#N3-130), providing more room to display its increased product offerings of components and solutions for Gaming, Amusement, Sports Betting, Lottery and Bingo. "We are excited to be participating at ICE again," says Goran Sovilj, SUZOHAPP?s Executive Vice President of Gaming & Amusement in Europe. "?Simplify your sourcing? is the message we want to communicate this year. We are proud to provide the world?s largest offering in the gaming and amusement industry - just about anything you need, we can source it." SUZOHAPP - a leading software and hardware supplier of complete cash management solutions, with over 50,000 gaming, amusement, sports betting, lottery and bingo products for casino operators and Gaming OEMs - reports a very positive participation at the EAG show that took place in London, UK, between the 15th and the 17th of January. 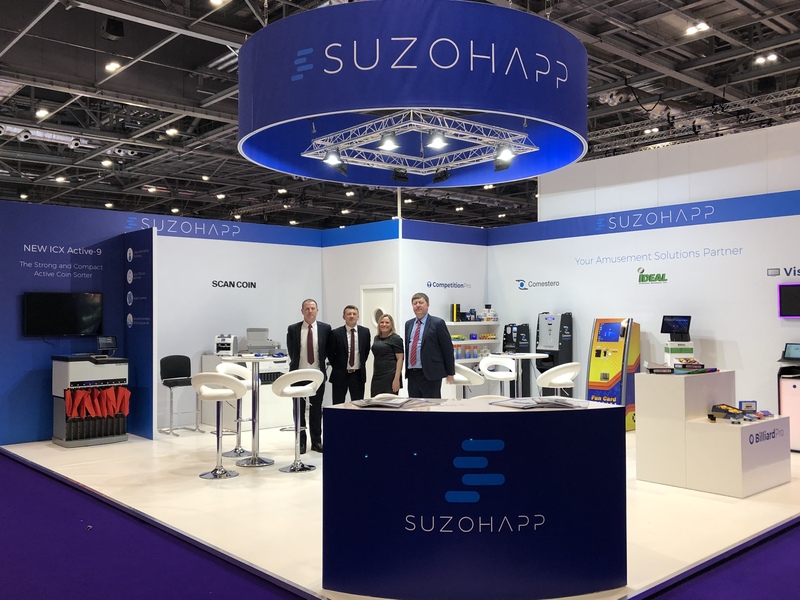 SUZOHAPP took the opportunity to exhibit its latest innovations and demonstrate its focus on cash handling solutions which can help amusement operators manage their cash efficiently and reduce costs significantly. "Operators have diverse cash management requirements. With our back-office cash handling solutions and our excellent brands, such as CashCompleteTM, SCAN COIN and Comestero, we are able to serve this market segment successfully," said Norman Ridall, Sales Manager of SUZOHAPP in UK and Ireland. Solutions of main interest that were on display were the SCAN COIN coin and note counters and sorters: the new ICX Active-9, the SC-8220, the SC-306 and the DTC-9. The IDEAL cashless solution and the Comestero change machines were also big hits at the SUZOHAPP booth. SUZOHAPP is pleased to announce that it has appointed Automated Gaming as its sales representative and service centre for the Spanish gaming market, effective January 1, 2019. Based in Barcelona, Automated Gaming will support SUZOHAPP with two Sales Representatives with 20+ years of experience focused on Business Development. Also, a local Pre-Sales Technical Specialist will be dedicated to SUZOHAPP?s Spanish customers. "We are pleased that Automated Gaming will now be supporting us in Spain. We believe this agreement will further increase our presence in this market," stated Goran Sovilj, SUZOHAPP Executive Vice President of Gaming & Amusement, EMEA. "Automated Gaming is a recognised and respected company in the Spanish gaming industry and its team has in-depth knowledge and proven experience." "We are proud that SUZOHAPP has chosen us to support its growth strategy in Spain," said Genis Catà, CEO of Automated Gaming. "SUZOHAPP is a household name in the global gaming industry with a portfolio of unique components and solutions that meets the demands of various gaming market segments. We see great opportunities to further expand SUZOHAPP?s presence in Spain." "This group is about customer care, innovation and expertise development. The additional focus will help us anticipate and address customer needs, develop and deepen our expertise, and drive innovation in the markets we serve," says Herriman. "We expect this change will create significant growth for our Digital products, solutions and services." "Software is a core differentiator for us in the market," says Drew Scielzo, Chief Executive Officer of SUZOHAPP. "Given our continued investment in this area, it made sense to create a group focused solely on our software products and digital payment solutions." This new business unit will be headed by Rory Herriman, SUZOHAPP's current Chief Technology Officer for Software and Digital Systems. Herriman will assume the new role of Executive Vice President and General Manager for SUZOHAPP Digital. Castles Technology International Corp., a globally recognized and industry-leading manufacturer of payment hardware solutions, and SUZOHAPP, the global market leader of software and hardware cash management solutions, announced today that both companies have entered into a multi-year partnership agreement, which includes the co-development and delivery of next-generation cashless terminals within unique sales channels throughout the global unattended marketplace. SUZOHAPP — a leading technology company with over 50,000 gaming, amusement, sports betting, lottery and bingo products for casino operators and gaming OEMs — will be exhibiting at the EAG show. Owned by Bacta, the trade association for the amusement and gaming machine industry in the UK, EAG offers an outstanding opportunity to network with amusement and leisure professionals, share information and experience the very latest product launches and innovations. Taking place in London, UK from January 15-17, 2019, EAG will be celebrating its 10th anniversary. SUZOHAPP will be exhibiting at Booth #405 and will be displaying the highlights from its portfolio of world-class products, including individual components as well as complete solutions. "The EAG is a perfect networking event, giving us the chance to show our innovative approach to the industry," says John Vallis, Vice President of Gaming and Amusement EMEA. "We work closely with both manufacturers and operators and support them in finding the right solutions to meet their unique requirements. We provide them with every single component they need, significantly simplifying their sourcing." SUZOHAPP — a leading technology company with over 50,000 gaming, amusement, sports betting, lottery and bingo products for casino operators and Gaming OEMs ? will be exhibiting at the Balkan Entertainment and Gaming Expo (BEGE). BEGE is the meeting point for the gaming and entertainment industry in the Eastern European region. Each year, the exhibition gathers over 5,000 international visitors from 35 countries and offers an outstanding opportunity to establish new business contacts and to present the latest developments in gaming technology. Taking place in Sofia, Bulgaria from November 21-22, 2018, SUZOHAPP will exhibit at Booth #3.14 and will feature a comprehensive offering of advanced components for gaming machines and sports betting terminals. This includes, but is not limited to, LCD monitors featuring excellent brands, such as Elo Touch Solutions and SUZOHAPP's VisionProTM, in addition to a rich selection of cabinet parts, such as bill validators, printers, coin mechanisms, LCD button decks, pushbuttons, barcode scanners, locks, toppers, and more. As a major highlight, SUZOHAPP will be showcasing its new VisionProTM Edge-Lit LED Touch and Non-Touch monitors as well as its next-generation Dynamic Panel Systems - the latest innovation in pushbuttons. Two innovative solutions that demonstrate how SUZOHAPP is developing cutting-edge technology for the requirements of today and tomorrow. The EVEX — The European Vending Experience — will open its doors on the 15th and 16th of November in Sevilla, Spain and will be organized by the European Vending Association (EVA) in collaboration with the Spanish Vending Association (ANEDA). The event aims to once again bring together all sectors of the vending and Office Coffee Service (OCS) industry, offering participants a range of unique networking opportunities, a commercial exhibition and an attractive setting. SUZOHAPP will be a Bronze Sponsor at EVEX 2018. 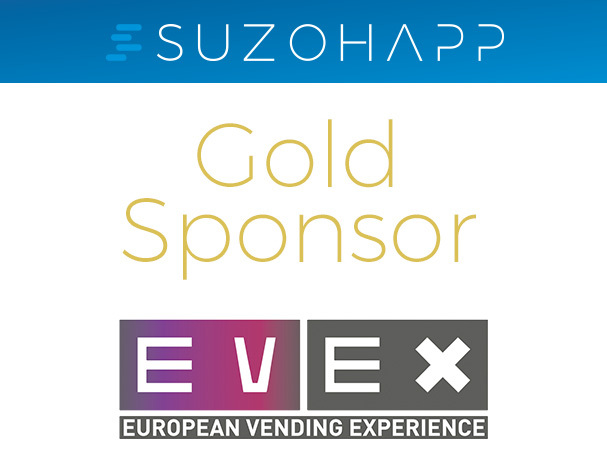 "We continue to support the EVEX year after year as it is a must-attend event for the European Vending industry and a great occasion to meet and exchange ideas and experiences with key players within it," says François Profit, Executive Vice President of Automated Services for SUZOHAPP. "Also, it gives us the opportunity to build and strengthen relationships with new and existing customers." At this year's EVEX, SUZOHAPP will exhibit at stand 37 and will feature its wide range of component offerings for vending machines, from the Currenza C2 coin recycler to the WorldKey and P6 cashless ranges. These advanced solutions take payment processes to the next level by maximizing operators' profits and reducing machine downtime. SUZOHAPP to participate at ATMIA "ATM & Payments Innovation Summit"
SUZOHAPP will be presenting at the upcoming ATMIA conference that will take place at the Eurostars Madrid Tower Hotel between the 17th and 19th of October. The annual event is organized by ATMIA, the trade association representing the entire global ATM industry, bringing together over 500 ATM & Payments professionals. The theme of this year's conference is "Seeing The Future, Today" and the presentations will focus on the creation of a better and more profitable future for the ATM and Payments Industries. The ATMIA conference will be an ideal opportunity for SUZOHAPP to present the Crèdit Andorrà success story, a project started in 2008. Carlos Durán, Solutions Managing Director at SUZOHAPP Spain, will present "A successful coin branch transformation model in Andorra, a crucial part of the local cash cycle" (19/10/2018 16:25-16:45) as a conference speaker together with Josep Escoriza, IT & Organization Division Director, Crèdit Andorrà. "Cash is a reality that the banking sector tends to see as a drawback - a cost without payback. Cash can become an instrument for customer acquisition, loyalty and business generation, through automated cash management technology," stated Mr. Durán. "Our new SCAN COIN CDS-9R is the most advanced solution which offers a recirculation of coins and notes amongst the branch clients. It is driving banking transformation further." SUZOHAPP - the global market leader of software and hardware cash management solutions partners with Everi Payments Inc. - the casino gaming industry's single source provider of gaming products and financial technology solutions. The fully integrated solution will accelerate and advance cash management and automation within the gaming industry. The casino industry handles millions of dollars in cash transactions per day. Kiosks, cash cages, retail POS systems, and all casino floor cash and payment activities must be accounted for by back office operations and reconciled by corporate accounting and audits. The fast-paced, fraudulent vulnerable environment is constantly at risk of employee theft, inaccuracies in cash reporting caused by human error, and wasted time tracking and processing cash through rudimentary hardware and old-school software that do not communicate with one another. The SUZOHAPP - Everi partnership combines two world-class companies and solutions to give casino customers an unprecedented end-to-end cash management solution. Their partnership has also born an ambitious plan to develop a vertically integrated cash automation management solution that captures all activities within the cash life cycle and ties it to core accounting systems. All software and hardware are vertically integrated, meaning the product is built from the ground up, from hardware to software development, by SUZOHAPP and Everi teams. "Operational visibility in cash management is a critical concern in the gaming industry," says Darren Simmons, SVP - Payment Solutions for Everi. 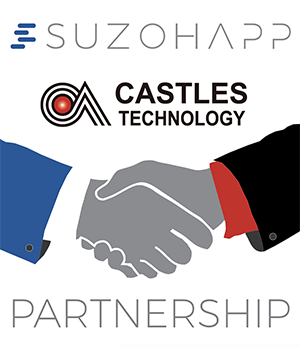 "This partnership with SUZOHAPP is an opportunity for both companies to offer Casino customers a unique solution that seamlessly integrates front of the house with back of the house cash operations, maximizes visibility throughout the entire cash management process, and ultimately helps casinos efficiently monitor, process, and forecast their cash." SUZOHAPP announced today that it has entered into a joint marketing effort with the German/IOM-based software company, Digitote, to provide a scalable, flexible hardware and software offering to the quickly emerging U.S. sports betting industry. In May, the U.S. Supreme Court overturned a federal ban on sports betting, allowing states to legalize it. This legislative change opens up vast opportunities for business owners and entrepreneurs to offer sports wagering capabilities across a myriad of platforms, including online, kiosk, tablet, terminal and self-service. For over 30 years, Digitote has been developing customized sports wagering software applications for its international customer base. For over 60 years, SUZOHAPP has been designing and manufacturing customized, reliable and well-supported hardware solutions for the global gaming market. "Our strategic arrangement with SUZOHAPP will enable each of us to use our strengths to drive this market opportunity forward," said Gunter Boyks, CEO of Digitote. "The solution we will offer the U.S. market is customized and flexible, allowing operators to choose from multiple options of user interface, a variety of hardware products and software applications, or a complete, managed, custom solution to meet their needs in the most cost effective, easiest to implement way." 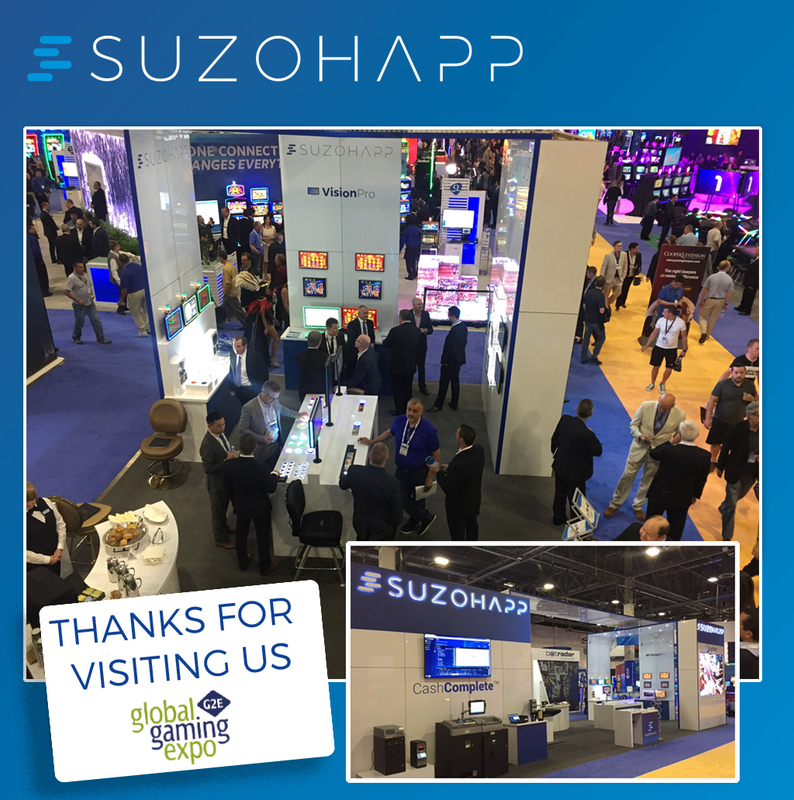 SUZOHAPP - a leading technology company with over 50,000 gaming, amusement, sports betting, lottery and bingo products for casino operators and Gaming OEMs - has been exhibiting at The Global Gaming Expo (G2E) for over 20 years. Presented by the American Gaming Association (AGA) and organized by Reed Exhibitions, G2E is the largest gathering of global, commercial and tribal gaming professionals in North America. The event showcases the latest developments in gaming technology and features new educational content that is fast - paced and actionable. Attendees will experience firsthand the new products and innovative technologies showcased on the expo floor. "Gaming and amusement has been part of SUZOHAPP's core business for over 30 years," says Sim Bielak, Chief Marketing Officer of SUZOHAPP. "It's important for us to attend these tradeshows to continue to build relationships with our existing customers and to introduce our latest product offerings to new customers." We are very proud to announce that we have been selected as a Finalist in this year's The Vendies, the prestigious awards ceremony for the vending and water industries. Our Vantage bill validator has been shortlisted in the Best Payment System category. Winners will be announced on the 2nd of October 2018 at the ceremony at the Forest of Arden Marriot Hotel & Country Club, Birmingham (UK). SUZOHAPP extends a warm invitation to visit its Stand #2-215 at the upcoming Euro Attractions Show (EAS), the IAAPA exhibition which will take place between the 25th and 27th of September in Amsterdam. Cash and cashless management are becoming increasingly important to operators in the amusement industry. Nearly everything revolves around payment possibilities - entrance fees, machine play, various game play, purchasing food, drinks and memorabilia, to name just a few. 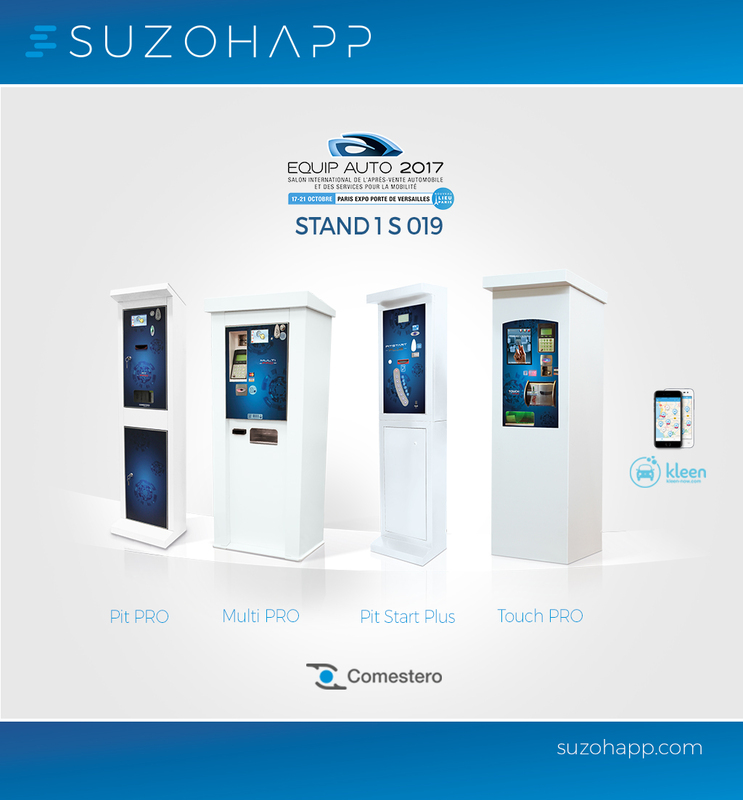 At this year's EAS, SUZOHAPP will showcase its extensive range of cash handling solutions, from individual components to complete cash management systems. One of the biggest highlights will be the new SCAN COIN ICX Active-9. This advanced coin sorter represents the new mid-range class of sorters and offers invaluable support to operators in their day-to-day operations. Equipped with a 10" touch screen interface, it can sort up to 9 different coin types / tokens at a rate of up to 2,700 per minute. SUZOHAPP is pleased to welcome all attendees at Innotrans, which will take place in Berlin, Germany between the 18th and 21st of September. SUZOHAPP will be exhibiting at Booth 214 (Hall 2.1) featuring its wide product range and displaying its latest innovations in cash management technology for transportation and parking environments. An advanced coin handling device which tackles the challenge of optimizing coin pay out in ticketing machines. The ICS enables payout of all coin denominations and its compact design makes it easier for manufacturers to incorporate into their solutions. This Recycling Cash Solution streamlines cash handling with automated till float creation, coin recycling, change facilities, and end of shift deposit and reconciliation. The new 2.2 version comes with a flexible system for different tills. Coupled with the CashCompleteTM Connect software platform, this complete solution automates cash handling operations for complete visibility of the cash cycle, allowing users to retrieve real-time cash flow data via computer or mobile device. The CDS-820j is a powerful self-service solution for bulk coin deposits, featuring a modern and intuitive user interface. It can be integrated with the CashCompleteTM SDS-300 Smart Deposit Solution that provides a cost-effective method of securing banknotes. The RetailEX ASEAN is the largest international exhibition and conference in Southeast Asia for the Retail industry. This year RetailEX, under the theme "Transforming the ASEAN Retail Landscape", will be held in Bangkok from the 19th to the 21st of September. SUZOHAPP will be exhibiting at booth #J9-J10 and will be showcasing its latest innovations in cash management technology. Great focus will be placed on presenting the new CashCompleteTM SDS-35, a Smart Deposit Solution which validates, stores and instantly secures banknotes at the point of sale. Perfect for the table-top or under-the-desk environments of small retail stores, the SDS-35 reduces shrinkage and the number of touch points in the processing of banknotes. The new ICX Active-9 will also be presented at the SUZOHAPP booth. This compact and strong coin sorter is the all-in-one solution for any coin sorting need. It can dramatically boost retail business by increasing productivity, security and efficiency, thanks to its unique Active Sorting® Technology which enables outstanding features, such as multiple currencies processed, very high throughput, multiple set-ups and configurations. SUZOHAPP has deep expertise in developing and manufacturing cash handling components and this year?s RetailEX will be an excellent opportunity to present its most advanced innovations. First of all, Vantage and Vantage Connect - the inseparable duo for coin and note management which takes cash handling to the next level. Extremely robust and flexible, the Vantage bill validator is an industry-leading solution with a host of advanced features for highest in-service time. The Vantage Connect is a new IoT-ready device which represents a significant innovation in coin acceptance and recycling technology. "We are thrilled to welcome Simon to the SUZOHAPP team," said Wilbert Bieleman, President of SUZOHAPP's Europe-Middle East-Africa (EMEA) Region. "His extensive experience has given him an understanding of our customer base that will allow us to better serve our customers and support company growth." 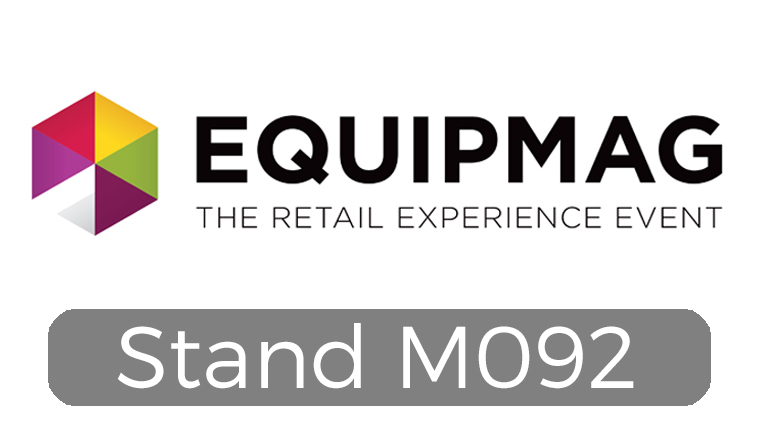 SUZOHAPP is excited to participate again at EQUIPMAG, the must-attend French tradeshow for retail organizations, featuring the most innovative solutions to help retailers create, redesign, manage and optimize their business. The event is set to open its doors between the 10th and 12th of September in Paris, France and SUZOHAPP will be exhibiting at stand M092. CashCompleteTM RCS-400 2.2, a Recycling Cash Solution which streamlines your cash handling with automated till float creation, coin recycling, change facilities, and end of shift deposit and reconciliation. The new 2.2. version comes with a flexible system for different tills. CashCompleteTM SPS-700 & SPS-800, the next-generation Smart POS Solutions which leverage best-in-class technology from the successful CashCompleteTM SPS-500 & SPS-600, recycling note & coin systems that have become the benchmark for complete POS automation, securing cash and reducing counterfeits in the check-out lanes. All CashCompleteTM solutions also offer real-time data and remote monitoring with the new CashCompleteTM Connect monitoring software, a cloud-based platform which allows customers to fully monitor their cash and generate accurate reporting for complete visibility of the cash cycle. SUZOHAPP is pleased to introduce Markus Prader as its new Business Development & Key Accounts Manager for the region covering Europe, the Middle East and Africa (EMEA). Prader's appointment became effective August 13, 2018. He is based in Europe. 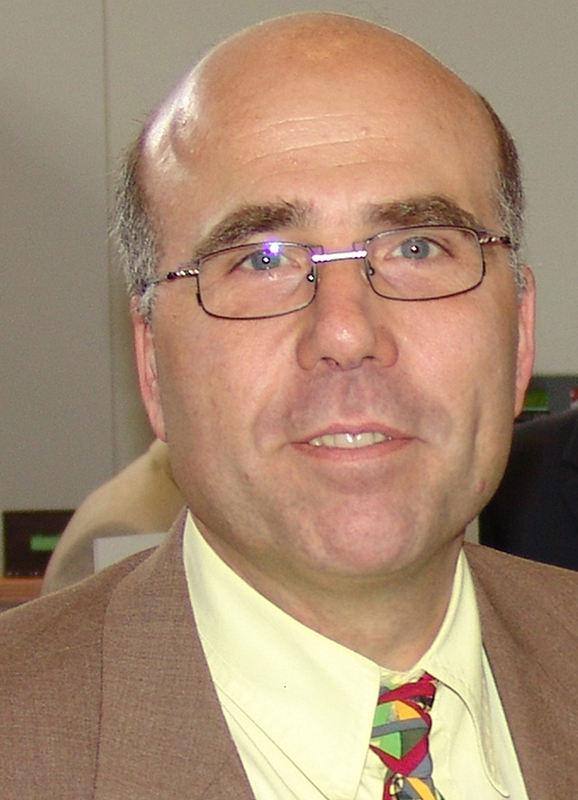 Prader brings with him significant experience in and contributions to the global gaming industry. He spent 7 years as Business Development Director at Crane Payment Solutions. He also held a number of senior positions in casino operations around the world, ranging from Harrah's (Rio) and MGM Grand in Las Vegas to Tsogo Sun and Gold Reef Resorts in South Africa to Storm International and Russian Gaming Industries in Moscow. Prader founded MP Gaming in South Africa and he was a partner at Tajitsu Industries, a predictive analytics and AI company, based in Gothenburg, Sweden. "We are pleased to have Markus join our growing team in Europe." said Goran Sovilj, EVP Gaming & Amusement EMEA at SUZOHAPP. "He brings a wealth of knowledge and experience to the organization." As part of his new role at SUZOHAPP, Prader will focus on customer relationship development in the promising DACH portion of Europe, which includes Germany, Austria and Switzerland. 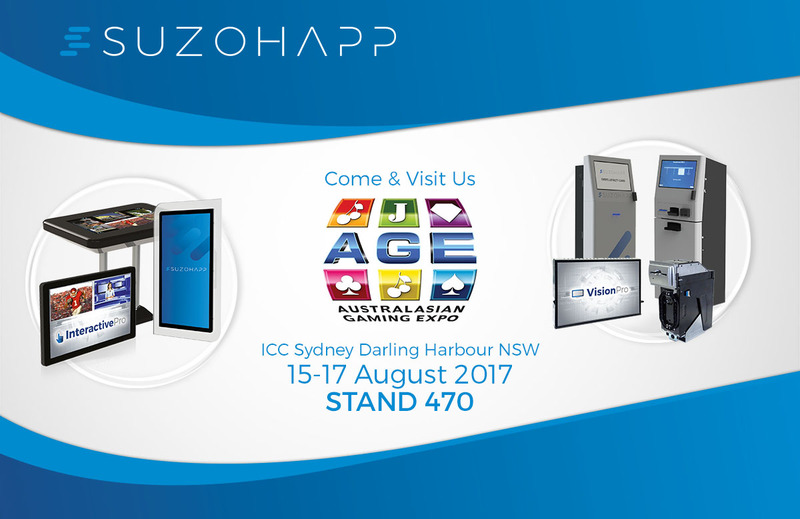 SUZOHAPP extends a warm invitation to visit Stand #470 at the upcoming Australian Gaming Expo (AGE) that will take place between the 14th and 16th of August in Sydney. Visitors will have the opportunity to meet the Australian team and get the latest information on SUZOHAPP's extensive portfolio of solutions for the Gaming industry. At this year's AGE, SUZOHAPP is excited to introduce new innovations to the Australian market. The Nanoptix advanced printing solutions will be proudly presented for the very first time, including the PayCheck NextGen, the PayCheck Terminal and the PayCheck 4. The brand new 27" Touchscreen Kiosk will also be in the spotlight. This solution offers an optional LED display and is fitted with a Nanoptix HSVL Advance Thermal Printer. Further innovations include the DPS (Dynamic Panel System) featuring PKT technology which takes touchbutton technology to the next level, as well as the CashCompleteTM SDS-35, the Smart Deposit System that secures cash and prevents shrinkage and counterfeits. A special focus will be put on the range of VisionPro LCD slot machine screens which are available for most EGM models and in a range of sizes. Visitors looking for the latest technology in coin and banknote counting/sorting will enjoy seeing the SCAN COIN desktop solutions, including the SC-8220, the DTC-2, the SC-303 and the SC-360. Comestero Easy Pro and Twin Jolly Pro, the best-selling change machines, will also be presented at AGE. SUZOHAPP is a global provider of high quality products for cash handling technology and, at AGE, manufacturers will learn more about the features and benefits of a rich selection of components. For coin-in, show attendees will see the Comestero RM5 electronic coin mechanism that offers excellent coin discrimination and market-leading anti-fraud technology. For coin-out, they will appreciate the advantages of a variety of hoppers. For banknote validation and recycling, the MFL banknote reader and the Bill-to-Bill 300TM recycler will be highlighted. 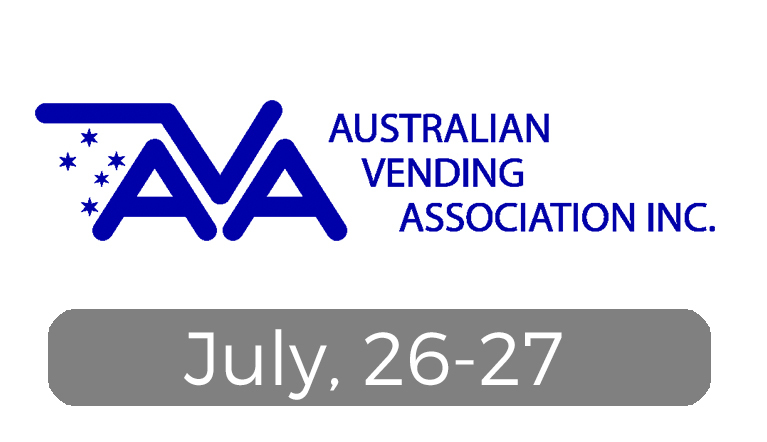 SUZOHAPP will be exhibiting at the AVA Vending Expo, the tradeshow organized by the Australian Vending Association, which will take place in Melbourne on July 26th & 27th. In the SUZOHAPP booth, great focus will be placed on presenting the new Vantage Connect coin recycler and Vantage bill validator, the perfect Payment Duo for all vending machines. These advanced solutions take cash management to the next level by maximizing operators' profits and reducing machine downtime. Vantage Connect is a new IoT-ready device which represents the latest innovation in coin acceptance and recycling technology. Thanks to the PRP (Payout Redundancy Protection) system, six tubes and three independent motors, it delivers superior results to vending operators in terms of high coin capacity, excellent payout reliability and maximum configuration flexibility. Vantage Connect is equipped with Wi-Fi capability which allows operators to modify all parameters, update firmware and optimize maintenance with a common smartphone or tablet, eliminating the need for proprietary handheld devices. With its recent acquisition of Coinco product lines, SUZOHAPP extended its Vending portfolio with a range of innovative payment solutions that includes the Vantage banknote validator. This is an industry-leading solution with a host of advanced features for highest in-service time. Extremely robust and flexible, Vantage is designed to enhance operator business by maximizing profitability. 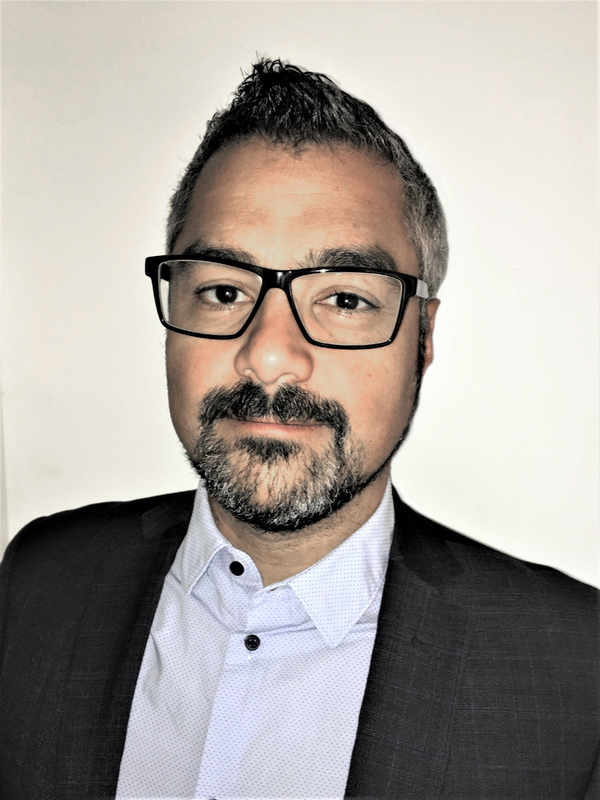 SUZOHAPP is pleased to announce that, effective July 2nd, Mike Sigona assumed the role of Global Gaming Product Manager and Business Development Manager for Europe. In his new role, Mike will oversee SUZOHAPP's global product strategy in the Gaming segment and will implement a growth strategy to enter new markets and increase market share. He will be based in Munich, Germany. 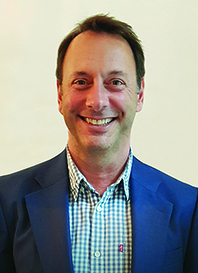 With more than 30 years' experience in display and touchscreen technology, Mike brings a wealth of executive experience and a significant amount of in-depth knowledge of the Gaming industry and other market segments. Before joining SUZOHAPP, Mike delivered outstanding results at Elo Touch Solutions, holding relevant management positions in Engineering, Sales, Marketing, and as Gaming Market Manager working in conjunction with SUZOHAPP. Over the years, he developed a vast skill set across the entire product development cycle, working directly with customers at each stage to ensure mutual success in the marketplace. 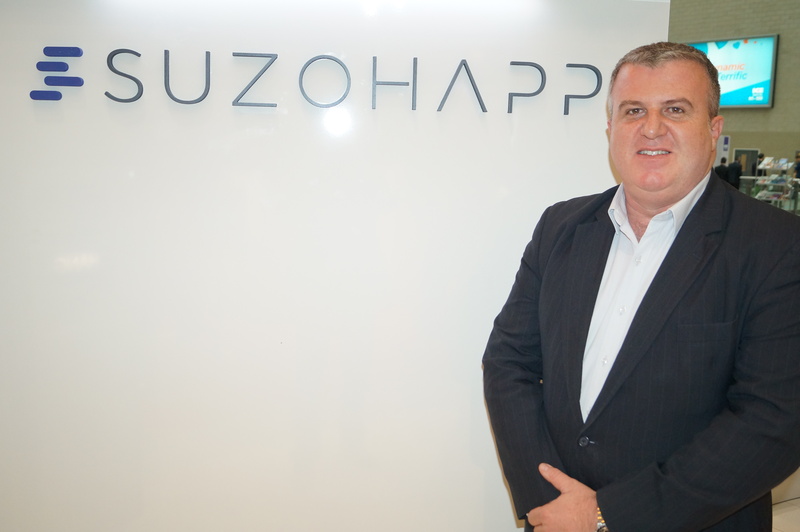 "We are very pleased to welcome Mike to the SUZOHAPP team. Our customers' needs are becoming more complex and it is crucial to develop innovative solutions to meet their expectations," stated Wilbert Bieleman, President and Managing Director EMEA. "With his valuable knowledge and expertise, Mike is an excellent addition to our team and will play a central role in driving innovation and business growth." "Mike Sigona commented, "I am really excited for the opportunity to take on this challenging new role. I look forward to being part of such a talented and dedicated team and contributing to the company's success." SUZOHAPP ensures excellent banknote acceptance and counterfeit rejection. This top level of security was recently recognized for the Bill-to-BillTM 300XE banknote recycler which successfully passed the latest BoE testing process in June 2018. "We are proud to have comfortably passed the Recognition Test with 100% of genuine GBP banknotes correctly accepted," stated Wilbert Bieleman, President & Managing Director EMEA. "Our Bill-to-BillTM 300XE has also successfully passed the detection test of counterfeit notes," commented Steve Fitton, Sales Director for UK Solutions. "This result proves the high level of accuracy of our validation technology." Transports Publics, the European Mobility Exhibition, is the not-to-be missed biennial exhibition for all the key players in public transport and sustainable mobility from across Europe. The event will open its doors in Paris, France from June 12th through June 14th and SUZOHAPP will be exhibiting at Stand K31, presenting a strong array of cash handling technology to the transportation industry. At this year's event, SUZOHAPP will showcase the highlights from its CashComplete™ product range which represent the ideal solution to transform users' cash handling into a completely automated process, delivering several advantages, such as reducing working capital, improving productivity and increasing efficiency. Visitors will have the opportunity to learn more about the features and benefits of the new CashComplete™ RCS-400 2.2, a Recycling Cash Solution which streamlines cash handling with automated till float creation, coin recycling, change facilities, and end of shift deposit and reconciliation. The new 2.2 version comes with a flexible system for different tills. Attendees will also enjoy seeing a demo of CashComplete™ Connect software, a revolutionary platform which allows users to fully monitor their cash and generate accurate reporting for complete visibility of the cash cycle. An additional CashComplete™ product showcased at the SUZOHAPP stand will be the SDS-750, a Smart Deposit Solution which provides a cost-effective method of securing banknotes while improving accuracy and cash visibility. 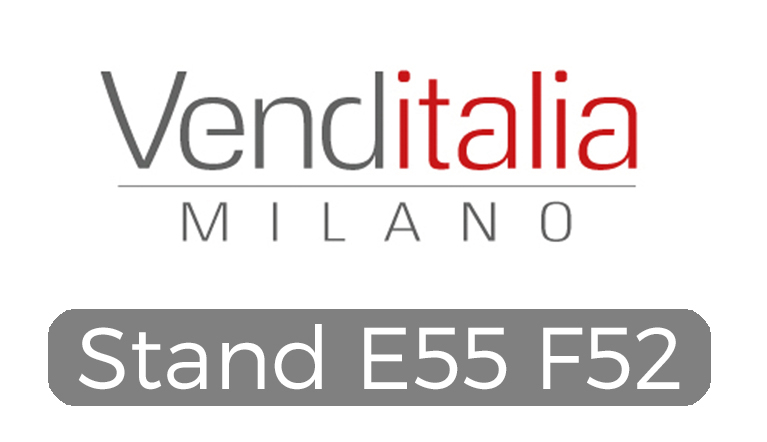 "We are excited to attend the upcoming Venditalia which will take place in Milan from June 6th through June 9th," stated François Profit, Executive Vice-President EMEA - Automated Services. "This year, we will present the perfect combination of payment systems to the vending market." With its recent acquisition of Coinco product lines, SUZOHAPP extended its Vending portfolio with a range of innovative payment solutions that includes the Vantage banknote validator. "Vantage, Currenza C2 and WorldKey are the perfect payment trio for all vending machines, as they guarantee maximum flexibility in payments and high transaction security," commented Luca Rossato, Sales Manager for Vending in Italy. Thanks to the PRP (Payout Redundancy Protection) system, the Currenza C2 coin recycler is the ideal solution for coin acceptance and payout. The Coinco Vantage bill validator is an industry-leading solution with a host of advanced features for highest in-service time. It will be presented at Venditalia in its brand new look. Last, but not least, is the WorldKey system which is the most complete and reliable cashless range in the market. SUZOHAPP will present its state-of-the-art product range at the upcoming UNITI Expo that will take place between the 15th and 17th of May in Stuttgart, Germany. This biennial event is the leading German trade fair for the retail petroleum and car wash industries. SUZOHAPP will exhibit at Stand 3E61-63, displaying a wide array of equipment for self-service car wash stations. At this year's event, the focus will be placed on the innovative PRO product line of Comestero starters and changers, designed for maximum performance and extreme reliability. Based on an advanced PC architecture, the PRO solutions offer a user-friendly experience thanks to the 5" or 10" touchscreens and the vocal guide. Furthermore, they are equipped with the latest generation payment systems and provide a wide configuration choice to personalize your machine. The biggest highlights at the SUZOHAPP booth will be the Multi PRO and the Pit PRO. Multi PRO is an outdoor money changer and starter for car wash portals, which allows the user to quickly manage multiple tasks, such as starting the programs, recharging cards and keys, changing money, buying tokens and distributing cards or keys. Designed to be resistant to dust, water splashes and sprayed chemicals, the Pit PRO manages up to 8 different washing programs, changes money or tokens and recharges keys or cards. Visitors looking for the latest technology in coin validation and recycling will enjoy seeing the Comestero RM5 coin validators and the Currenza C2 coin recycler. SUZOHAPP will also be showcasing a selection of hoppers and its complete WorldKey product line that is the most versatile and reliable cashless range in the market. 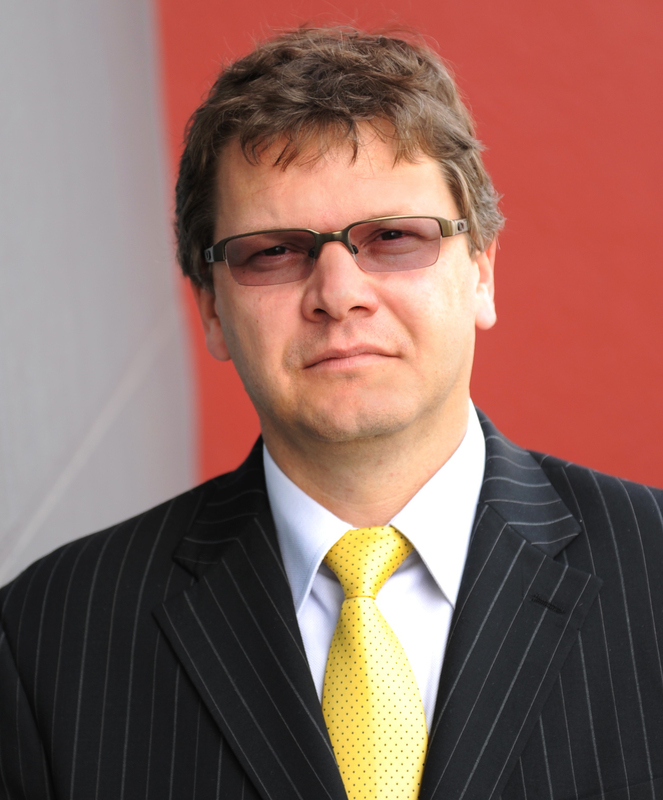 SUZOHAPP is pleased to announce the appointment of Günter Kuhl as Vending Sales Manager in Germany, effective May 16. With many years of experience within the German vending industry, Mr. Kuhl brings to this position extensive knowledge and valuable expertise. SUZOHAPP acquired the primary product lines of Coinco in April 2018. Mr. Kuhl will lead the integration of all Coinco products in Europe at SUZOHAPP. Günter Kuhl was responsible for sales and service for Coinco Germany for 17 years and, since 2016, for market development in the whole of Europe. He has made a name for himself as an excellent contact person for technical issues through his active work in the various technical committees of the BDV and the EVA. Mr. Kuhl will provide sales and service support to the German vending market. He will be working closely with the sales and technical staff within SUZOHAPP to ensure that all customers enjoy optimal support. He will also act as a link between sales and development, providing core market data and customer feedback so that SUZOHAPP can continue to provide market-leading solutions. "We are very pleased to welcome Günter to the SUZOHAPP team," commented Francois Profit, EVP Automated Service EMEA at SUZOHAPP. "There is no one in Europe who knows Coinco products better and we look forward to strengthening our position in Germany through this appointment." SUZOHAPP will be exhibiting at the upcoming Self-Service Banking Europe that will take place at the Royal Lancaster Hotel in London, between the 14th and 15th of May. The event is RBR's flagship European conference and the region's premier ATM and self-service banking event. It involves the world's leading financial institutions, innovative startups and fintechs. The Self-Service Banking Europe event will be an excellent opportunity for SUZOHAPP to showcase a selection of SCAN COIN Cash Processing Solutions and CashCompleteTM Connect, a software platform which allows you to fully monitor your cash and generate accurate reporting for complete visibility of the cash cycle. The combination of this software intelligence and leading processing technologies transforms your cash handling into a completely automated process. 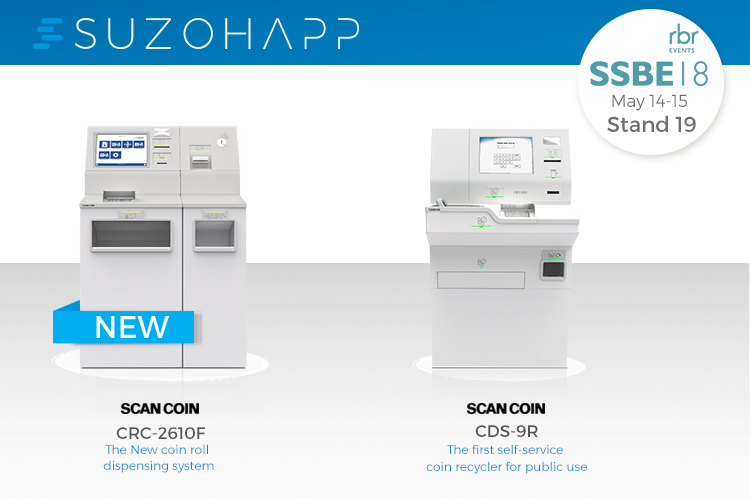 In the SUZOHAPP booth, the attention will be focused on the innovative SCAN COIN CDS-9R, the world's first self-service coin recycler for public environments. A new banking solution for coin deposit as well as coin dispense, the CDS-9R offers the most secure, reliable and effective way to handle self-service cash transactions. To be launched at this year's event is the new SCAN COIN CRC-2610F, the next-generation coin roll dispensing system. This new advanced solution is an automated dispenser for coins and/or banknotes of all denominations. It combines maximum flexibility and adaptability, providing a high efficiency level for managing cash. SUZOHAPP is excited to participate again at the National Restaurant Association Show, the platform to discover, learn, connect, inspire and gain the tools needed to innovate and thrive in the international restaurant marketplace. The tradeshow is set to open its doors in Chicago, Illinois, between the 19th and 22nd of May. SUZOHAPP will be exhibiting in the Technology area at Stand 7075. Restaurants spend a significant amount of time dealing with cash. Relying on manual counting and processing of cash can be difficult and cost intensive. New cash management technology from SUZOHAPP offers an immediate solution to improve cash flow, thus reducing handling costs, increasing speed and accuracy, and delivering a rapid and significant return on investment. At this year's NRA show, SUZOHAPP will showcase the highlights from its CashCompleteTM product range which represents the ideal solution to transform your cash handling into a completely automated process. SUZOHAPP experts will be on hand to show customers the complete range of CashCompleteTM units. CashCompleteTM Connect is a revolutionary platform which allows customers to fully monitor their cash and generate accurate reporting for complete visibility of the cash cycle. The combination of this software intelligence and advanced processing technologies will deliver better customer service and lead to a boost in profits. 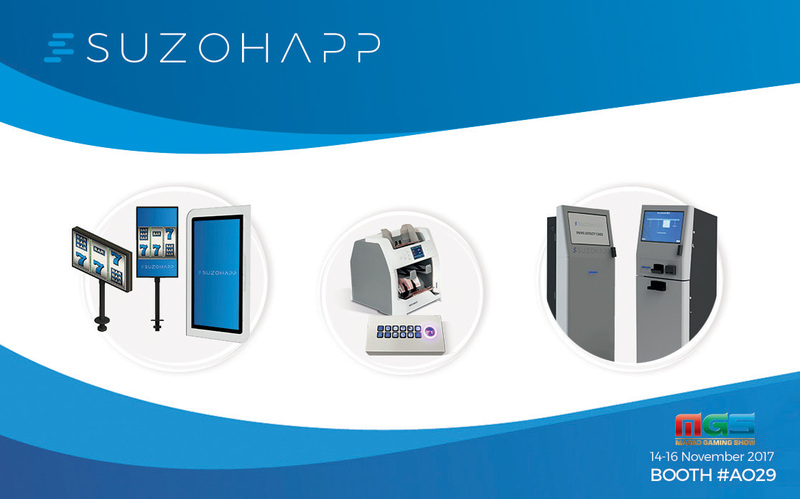 In the SUZOHAPP booth, great focus will be placed on presenting the new CashCompleteTM SDS-35, a Smart Deposit Solution which validates, stores and secures banknotes effectively in high volume retail and POS environments. The SDS-35 reduces shrinkage and the number of touch points in the processing of banknotes. 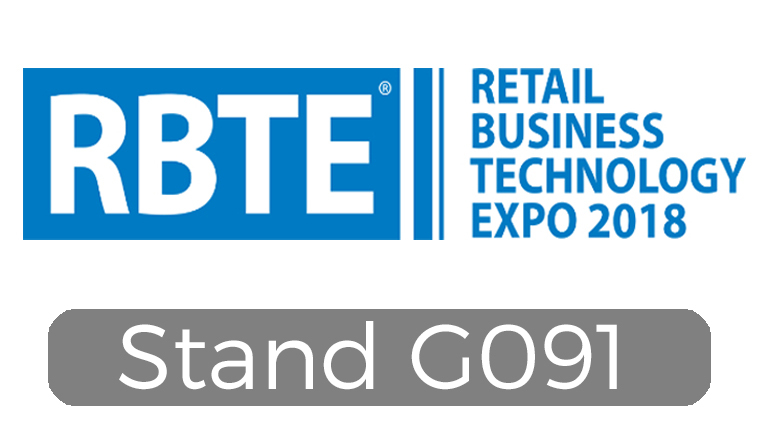 SUZOHAPP will be exhibiting at the upcoming RBTE, the must-attend event for retail and hospitality organizations which will take place from May 2-3 in London. Visitors are invited to the SUZOHAPP Stand (Booth G091) to see its next-generation solutions for store cash management. CashCompleteTM SDS-35, a Smart Deposit Solution which represents a cost-effective method of optimizing the cash deposit process during point of sale and back office operations, helping prevent till shrinkage and giving multiple levels of additional security. CashCompleteTM SPS-700 & SPS-800, the next-generation Smart POS Solutions. These soon-to-be released solutions leverage best-in-class technology for recycling note & coin systems that have become the benchmark for complete POS automation, securing cash and reducing counterfeits in the check-out lanes. SUZOHAPP experts help customers choose their ideal combination of CashComplete? solutions, always connected to the CashComplete? Connect software, a revolutionary platform which allows you to fully monitor your cash and generate accurate reporting for complete visibility of the cash cycle. The combination of this software intelligence and leading processing technologies transforms your cash handling into a completely automated process. 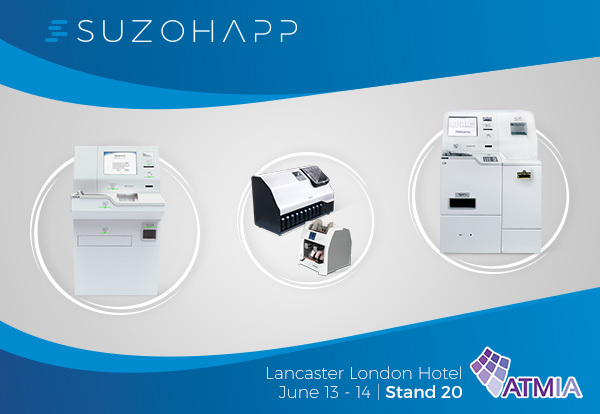 Additional products showcased at the SUZOHAPP stand will be the CashCompleteTM SDS-100 & SDS-150 note deposit systems, the SCAN COIN desktop solutions (DTC-9 and K-2) and a rich selection of cash handling equipment, such as coin and note validators, hoppers and bill recyclers. The very best of cash and cashless payment methods - that is what visitors to the upcoming Vendex show can expect to see from SUZOHAPP. Vendex is the premier event for the UK vending industry and at this year's show, cashless payment technology continues to be a key focus. It is important that vending operators ensure that consumers can use their cards or mobile phones at the vending machines, as up to 75% of consumers carry at least one payment card with them or have a payment app available on their mobile phone. More cashless transactions mean fewer requirements to handle cash which reduces operator costs. Thus, fitting a cashless payment terminal can increase sales and reduce costs at the same time. The SUZOHAPP P6 series is the cashless payment solution for all types of vending machines in all types of locations. Two terminals are available: the P66 'The Plane' (contactless and mobile) and the P68 'The Arc' (contactless, mobile, chip and magnetic). Therefore, all card payment methods are available. Mobile payment includes Apple Pay, Samsung Pay and Android Pay. A further benefit to the P6 series is its telemetry capabilities. The SUZOHAPP CURO web portal provides access to revenue / sales data from each individual vending machine or groups of machines. Operators can easily review revenue data, seeing the number and amount of both cash and cashless transactions. For locations requiring private cashless payments (such as offices and other workplaces), the WorldKey range offers a truly flexible cashless payment solution. It includes a wide array of products, such as the WorldKey Loyalty platform, an on-line solution that allows operators to communicate directly with end users and develop loyalty programs. The best-in-class solutions for cash handling, the 6-tube Currenza C2 coin recycler and the Comestero RM5 coin validator, will also be displayed. As part of the acquisition, SUZOHAPP has also hired key commercial, engineering and operational employees from Coinco in order to provide excellent support to all new and existing customers. Mount Prospect, Illinois - SUZOHAPP anuncia hoy que se ha completado la adquisición de las líneas de producto sin efectivo y con moneda primarias de Coinco, un líder mundial en el diseño y la fabricación de soluciones de pago para el sector de las máquinas expendedoras, con sede en St. Louis, Missouri. Fundada en 1958, Coinco lideró el camino en el desarrollo de productos, abasteciendo al mercado con una vasta gama de soluciones de pago de valor añadido, incluyendo sus bien conocidos cambiadores de monedas, validadores de billetes, lectores de tarjeta y tecnología sin efectivo. Se han añadido algunas nuevas e importantes ofertas a la cartera de SUZOHAPP, tales como el reciclador de billetes Vantage VR6 y la línea iris de sistemas sin efectivo. La fuerza de la marca Coinco ha desembocado en un éxito significativo en el mercado estadounidense. SUZOHAPP espera recrear este éxito en los mercados internacionales aprovechando sus importantes recursos y su huella global, especialmente en Europa, donde SUZOHAPP cuenta con un próspero negocio en el sector de las máquinas expendedoras. El servicio en América del Norte de la gama completa de productos Coinco seguirá siendo suministrado por la red de asistencia Coinco, que seguirá estando operativa a través de Coin Acceptors Inc.
"Esta adquisición de las líneas de producto Coinco es importante para SUZOHAPP, ya que nos permite seguir ofreciendo a nuestros clientes de máquinas expendedoras una oferta de productos global basada en la tecnología. Bajo el liderazgo de Jack Thomas, Coinco consiguió una sólida reputación en el mercado por proporcionar soluciones de pago innovadoras y fiables. Esperamos continuar con ese legado", comenta Drew Scielzo, SUZOHAPP CEO "Damos la bienvenida al equipo Coinco al grupo SUZOHAPP." Para el artículo completo, descargue el comunicado de prensa a continuación. SUZOHAPP will present its state-of-the-art product range to the transportation industry at the Intertraffic tradeshow that will take place between the 20th and 23rd of March in Amsterdam. SUZOHAPP and S+M GmbH will jointly exhibit at Stand 03.203 (Parking area), displaying a wide array of cash handling equipment. SUZOHAPP is the ideal partner for all manufacturers, providing the right solution to meet any need. At this year's Intertraffic, SUZOHAPP will introduce an outstanding innovation - the ICS (Intelligent Coin System), a new coin handling device that enables payout of all coin denominations. Customers should be able to pay with any coins, from the lowest to the highest denomination. This presented a challenge for many years, as often each coin type had to be paid out by an individual coin hopper. This increased not only the machine cost, but also the machine size. "We developed the solution," explained Vincent Saubaber, Executive VP of Transportation Sales EMEA. "The ICS is a real step ahead in multi-denomination coin pay-out technology. This innovative unit represents eight hoppers and a sorter, all in one product. Its compact design makes it easier for manufacturers to incorporate into their solutions." Visitors looking for the latest technology in banknote validation and recycling will enjoy seeing the Bill-to-Bill™ product line and the MFL bill validator. 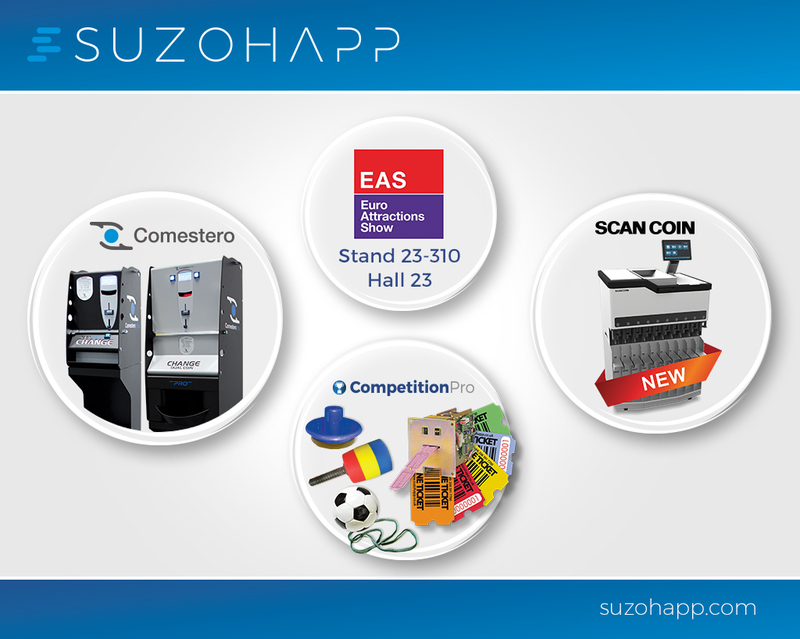 SUZOHAPP will also be showcasing its complete range of hoppers and Comestero coin validators. Other products on display will be the WGR coin carrousel, the C2 coin recycler, and a selection of locks. SUZOHAPP also offers complete solutions for operators, such as Comestero change machines and SCAN COIN coin and banknote sorters. Intertraffic attendees will have the opportunity to learn more about the SCAN COIN SC-8220 currency note counter which can manage more than 60 different currencies, and the DTC-2 and DTC-6 coin sorters which offer outstanding accuracy through unique sensor technology. SUZOHAPP will be exhibiting at the 5th International PLUS-Forum Online & Offline Retail 2018, which is going to take place in Moscow from March 14-15. The Forum is dedicated to the major tendencies and perspectives of the industry's development in Russia, the CIS and globally. SUZOHAPP will be present at Stand #3 to showcase the highlights from its portfolio of unique solutions that meets the demands of the Retail industry. At the SUZOHAPP booth, visitors will learn more about the CashComplete? product line which consists of a comprehensive range of Cash Deposit, Cash Recycling and POS integrated solutions for both back office and front office environments. These unique systems are scalable and can also be tailored to meet retailers? needs. SUZOHAPP experts help customers choose their ideal combination of units, always connected to the software platform CashCompleteTM Connect which allows you to fully monitor your cash and generate accurate reporting for complete visibility of the cash cycle. SUZOHAPP will be showcasing a selection of SCAN COIN solutions ideal for retail environments such as the DTC-9 coin sorter, the SC-8220 smart note counting solution, and the CDS-820j, the latest self-service bulk coin deposit solution. Visitors will get the latest information on cash handling components, including Comestero coin validators, Bill-to-Bill banknote recyclers and MFL bill validator, coin hoppers and the new ICS that is a real step ahead in multi-denomination coin pay-out technology. The SUZOHAPP team invites you to visit stand #3 to discover how to transform Your Cash Handling Operations! The SUZOHAPP team is looking forward to welcoming visitors at the Irish Gaming Show that will take place between the 6th and 7th of March in Dublin. SUZOHAPP will be exhibiting at Booth 27 to showcase its industry-leading range of amusement machine components and cash handling systems, which meets all expectations of both manufacturers and operators. For cash handling solutions, the brand new SCAN COIN ICX Active-9 will be taking center stage in the SUZOHAPP stand. This innovative coin sorter can sort up to 9 different coin types / tokens at a rate of up to 2,700 per minute. SUZOHAPP will also show a selection of SCAN COIN back-office solutions for coin and bank note sorting/counting, such as the SC-303 and the SC-8220. As the expert in money changing technology, SUZOHAPP will present the Comestero Dual Coin PRO and Easy PRO, the best-selling change machines in the industry. During the Irish show, visitors will have the opportunity to hear about how they can offer coin acceptance on their amusement machines thanks to the Comestero RM5 Evolution and RM5 HD electronic coin validators. SUZOHAPP is also the expert for coin pay-out devices and visitors will appreciate the advantages of a variety of hoppers. A rich assortment of pure Amusement solutions will be also displayed, such as the BilliardPRO and CompetitionPRO product lines. Finally, visitors will have the opportunity to see the Carrillo and Bonetti chairs. John Vallis, Vice President Gaming & Amusement EMEA, commented, "We are excited to exhibit again at the Irish Gaming show. This event is always the perfect opportunity to keep up to date, see what's new and find out what is happening in the Irish Amusement industry. Please join our experts at booth 27 to see a live demonstration of our latest innovations!" Cash is still one of the most common payment methods, especially in Europe, which requires retailers to find a way to handle it efficiently. At this year's EuroCis, SUZOHAPP will present its CashCompleteTM product range, the right solution to transform cash handling into a completely automated process. CashCompleteTM solutions are scalable and deliver several advantages, such as reducing working capital, improving productivity and increasing efficiency. They can be tailored to retailers' exact needs. SUZOHAPP will also unveil the CashCompleteTM SPS-700 & SPS-800, the next- generation Smart POS Solutions. These soon-to-be released solutions leverage best-in-class technology from the currently successful CashCompleteTM SPS-500 & SPS-600, recycling note & coin systems that have become the benchmark for complete POS automation, securing cash and reducing counterfeits in the check-out lanes. SUZOHAPP reports an extremely positive and successful ICE. There was a great turnout of Gaming professionals who were interested in the vast offering on display at the SUZOHAPP booth. Furthermore, this year's ICE saw SUZOHAPP introduce a new stand design with a clear open approach which was much appreciated. Visitors commented on how welcoming and professional the stand was. SUZOHAPP showcased a rich array of cash handling components and solutions which was well received by a large number of visitors. Of particular interest was the new SCAN COIN ICX Active-9, the innovative mid-range coin sorter that can count and sort up to 9 different coin denominations at a rate of up to 2,700 per minute. SUZOHAPP was also able to impress visitors with its new VisionPRO displays with 4-sided LEDs that come in 21.5", 23.8" and 27" in both touch (PCAP) and non-touch. Another innovation on the stand was the new PKT (Picture Key Technology) push buttons. This leading-edge technology combines SUZOHAPP's key capabilities in push buttons, displays and RGB LED design to create an innovative all-in-one solution. Thanks to this outstanding innovation, end users receive eye-popping content through a tactile button, creating a more rewarding, comforting and interactive experience with the gaming machine. SUZOHAPP announces the expansion of its EMEA sales team in the Vending industry. The new organization is intended to better serve customers in the EMEA region and to focus on the value provided to customers, while optimizing market coverage and leveraging personnel strengths. François Profit is the new Executive Vice President of Automated Services which includes the Vending, Car Wash and Laundry markets. Mr. Profit heads up the EMEA Vending team, composed of dedicated and focused professionals with excellent product knowledge. The ICE show is set to open its doors in London between the 6th and 8th of February. SUZOHAPP will be exhibiting at Stand N4-110 to showcase the highlights from its portfolio of unique components and solutions that meets the demands of various gaming market segments. For display technology, SUZOHAPP will launch the new line of VisionPRO displays with 4-sided LEDs surrounding the LCD that come in 21.5", 23.8" and 27" in both touch (PCAP) and non-touch. ELO touch screens will be in the spotlight with 90-series open frame monitors, desktop touch monitors and interactive digital signages. ICE will be a great opportunity for SUZOHAPP to introduce Nanoptix as its new global printer partner. 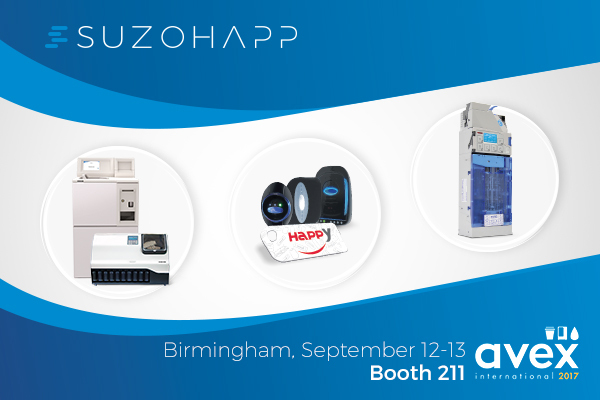 SUZOHAPP will be proudly exhibiting a wide array of printer solutions, including the Paycheck NextGen, Paycheck Terminal and Kiosk, Paycheck 4, and EZ-Tear that ensure top-of-the-line reliability, functionality and connectivity. At this year's ICE, SUZOHAPP will show an outstanding innovation - the new PKT (Picture Key Technology) push buttons. This leading-edge technology combines SUZOHAPP?s key capabilities in push buttons, displays and RGB LED design to create an innovative all-in-one solution. Game designers are no longer limited by the user interface and end users now receive eye-popping content through a tactile button, creating a more rewarding, comforting and interactive experience with the gaming machine. 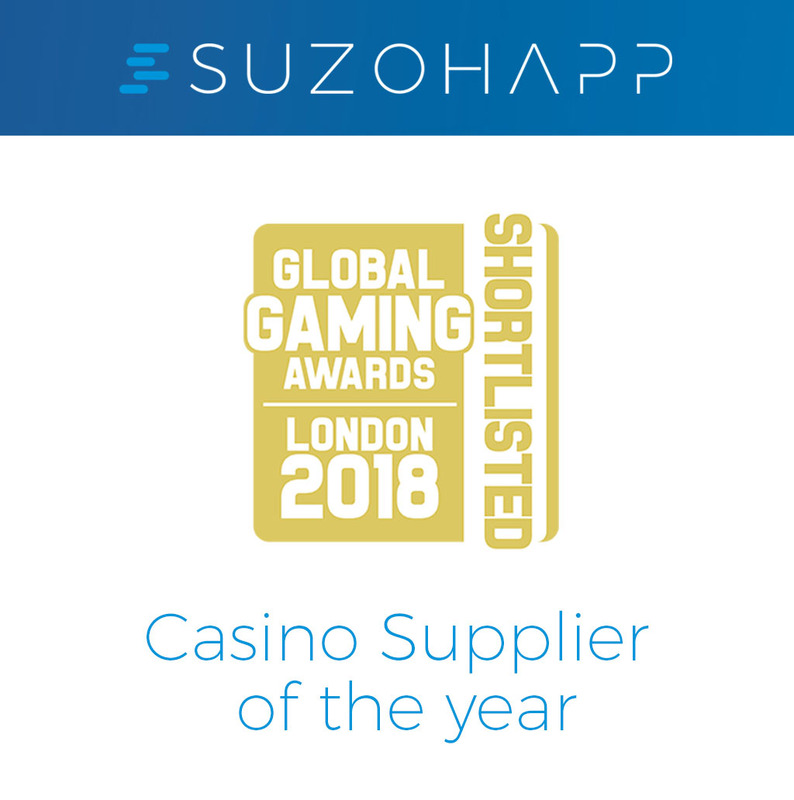 SUZOHAPP is pleased to be shortlisted in the category 'Casino Supplier of the Year' at the Global Gaming Awards London 2018. The Global Gaming Awards, now in their fifth year, will be heading to London for the very first time, with a nomination panel filled with industry experts and judges from every sector of the gaming industry. Winners will be announced during the awards ceremony at the Hippodrome Casino in London on Monday, February 5th. "This is very positive news. We are proud to have been nominated as a finalist in this key category," commented Goran Sovilj, Executive Vice President of Gaming & Amusement EMEA. "We place great emphasis on serving the casino market directly and have service and sales staff who work very closely with casino operators throughout the world." The number of SUZOHAPP solutions for casino operators has consistently increased over recent years and these solutions will be taking center stage in the SUZOHAPP stand at ICE. "This recognition means a great deal. It shows that our strategy to directly support casino operators is paying dividends and, more importantly, is highly valued by casino operators themselves. We are looking forward to a special evening at the Hippodrome and hope that we can start the ICE with a bang," added John Vallis, Vice President of Gaming & Amusement EMEA. 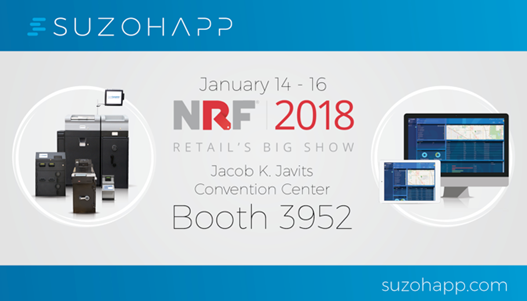 SUZOHAPP will be exhibiting at the upcoming NRF 2018 from January 14-16 at the Jacob Javits Convention Center in New York, NY. This year's theme is retail transformation and will preview bold new directions that will help players in this industry compete and succeed in a constantly changing market. SUZOHAPP will be at Booth 3952 (Level 3) presenting its next-generation cash management solutions. Handling cash manually is a time-consuming task for retailers. It should be a fast and simple process with minimal human involvement, providing optimal accuracy. SUZOHAPP helps automate all cash processing, switching the focus from cash management to value creation. At the SUZOHAPP booth, visitors will learn more about the CashCompleteTM product line which consists of a comprehensive range of Cash Deposit, Cash Recycling and POS integrated solutions for both back office and front office environments. These unique systems are scalable and can also be tailored to meet retailers' needs. SUZOHAPP experts help customers choose their ideal combination of units, always connected to the software platform CashComplete? Connect which offers superior financial and operational control of cash. To be launched at NRF is SUZOHAPP's latest innovation - the SDS-35. This new advanced deposit solution streamlines and automates the cash handling process, storing banknotes effectively and securely in high volume retail environments. The SDS-35 reduces shrinkage and number of touch points in the processing of banknotes. Other displayed solutions are the CashCompleteTM SDS-600 and the SDS-750, compact and versatile deposit systems that provide a cost-effective method of securing bank notes which increases accuracy and cash visibility. The SDS-600 has the capacity to handle the depositing needs of an entire franchise, but comes with a small foot print. The SDS-750 is known for its high-speed capacity, strong reliability and cutting-edge technology. The European Central Bank (ECB) is focused on the fight against counterfeiting through law enforcement, technical analysis and judicial cooperation, stressing the importance of installing only acceptance and control systems certified annually on every piece of equipment. The ECB regularly tests banknote equipment with a selection of the counterfeits most frequently seen in circulation, and publishes a list of machines and devices that have passed the test in order to help cash handlers and retailers choose a device to support them in authenticating Euro banknotes. SUZOHAPP ensures excellent banknote acceptance and optimal fraud note rejection. 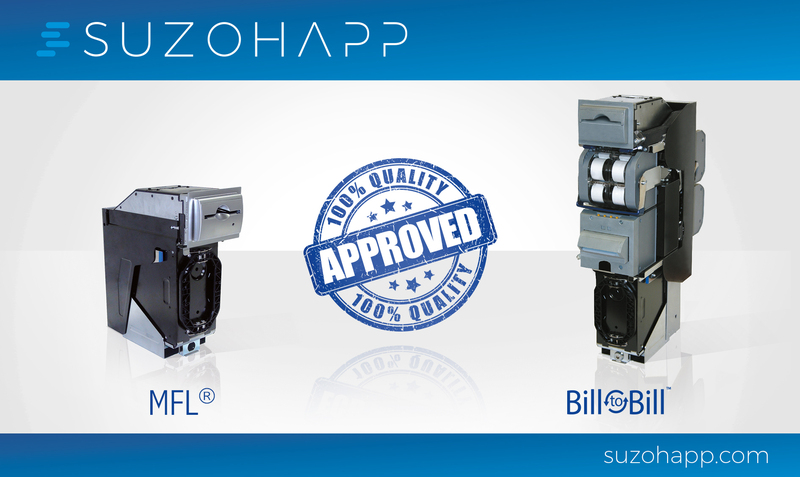 This top level of security was recently recognized for two products in the SUZOHAPP range: the Bill-to-BillTM banknote recycler and the MFL® banknote validator. Both successfully passed the latest testing process in December 2017. 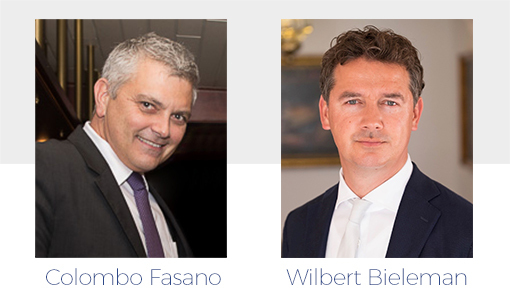 "Security plays an essential role for us and we are proud to have comfortably passed the ECB test with 100% of genuine Euro banknotes correctly identified," stated Wilbert Bielem an, President & Managing Director EMEA. The ECB has acknowledged the security of both products for their ability to recognize genuine banknotes and reject counterfeits. "This result confirms once again the maximum reliability we offer in our banknote validating and recycling solutions," concluded Mr. Bieleman. The test results are published on the ECB's website to help manufacturers choose the counterfeit detection equipment most suitable to their needs. The 2018 show calendar begins with the EAG, the British amusement show that will take place at London?s Excel between the 16th and 18th of January. SUZOHAPP will be exhibiting at Booth #400, showing its comprehensive portfolio of products for the Amusement industry. ?This year, we have increased our booth size to showcase our complete range of solutions, from individual components to complete cash management systems,? commented John Vallis, SUZOHAPP UK Sales Director and Vice President Amusement Sales EMEA. The brand new SCAN COIN ICX Active-9 will be taking center stage in the SUZOHAPP stand. This solution represents the new mid-range class of sorters. It can sort up to 9 different coin types / tokens at a rate of up to 2,700 per minute. Through years of research, development, testing and industry trials, the ICX Active-9 is engineered to be the best at delivering what any coin sorter should - accuracy and consistency. Visitors looking for the latest technology in coin and banknote counting/sorting will enjoy seeing other SCAN COIN desktop solutions, including the SC-8220, the SC-306 and the DTC-9. Operators often need to offer their customers the ability to change their money to play on the machines. SUZOHAPP has the right solution - the Comestero Dual Coin Pro and the Easy Pro which are the best-selling change machines in the industry. In the SUZOHAPP booth, significant focus will also be placed on the Live Ticket+ TITO System from InnoPrint which will include our Payhub Ticket Redemption Terminal. For cashless solutions, visitors will have the opportunity to learn more about IDEAL. The IDEAL solution brings simplicity to a complex payment structure that can often be found in family entertainment centers. IDEAL is flexible and secure and provides operators with a host of benefits through the sheer number of individual services ? all of which can be managed by this one system. IDEAL is card-based with various card reading abilities, making the solution very user-friendly. Customers can pay using the IDEAL cards anywhere in the location, they can extend card credit using the IDEAL self-service kiosks or, in the case of plastic cards, even by mobile phone. Managing Director APA and Global Gaming General Manager Geoff McDowell will be leaving SUZOHAPP at the end of 2017. McDowell will be assuming a senior position at a company located closer to his home in Melbourne. This new opportunity allows McDowell to stay within his area of industry expertise while maximizing time with his wife and young daughters. McDowell joined SUZOHAPP in 2013 when the company acquired Transcity Group, a developer of custom hardware solutions for the Casino and Wagering/ Sports Betting industries in Australia and Asia. Since the acquisition, McDowell has been leading the SUZOHAPP business in Australia and Asia. In 2016, Geoff took on an additional role as General Manager of Global Gaming, using his 25 years of industry expertise to form our strategic approach in this important space. Geoff was instrumental in securing and maintaining our largest gaming customer for several years and provided leadership and mentoring to his team throughout the globe. "Geoff is knowledgeable and well-respected, both internally and externally," said Drew Scielzo, Interim CEO. "During his time here, he was fully committed to helping our organization grow. We will miss his passion and dedication to his work, as well as the way he approached all things with a keen sense of humor," added. Mr. McDowell will continue to be involved with the business as needed during the transitionary period. "We thank Geoff for his years of service and leadership to SUZOHAPP. We wish him all the best in his new role" said Mr. Scielzo. SUZOHAPP is pleased to announce that, effective January 1st 2018, Alex Bucur has been appointed to the role of Vice President of Global Product Management. Bucur joined the SUZOHAPP team through the acquisition of SCAN COIN in 2015. He has been an integral player in the success of the SCAN COIN business, as well as a key leader in organizing the Product Management team. For the last year, Bucur has been leading the global product management efforts for the Solutions business. In his new role, he will manage both the SUZOHAPP Solutions and Components businesses globally. "As SUZOHAPP moves forward with our vision of bringing our Solutions and Components businesses together into a cohesive team, it made sense to structure our product management function in a similar way," said Wilbert Bielem an, Managing Director of EMA. "Alex's depth of experience and passion for product management positioned him perfectly to take on this new challenge." Bucur will work with his team, including Tom Orton, VP of marketing & product management NCS, to preserve the regional focus of the business while also identifying opportunities for global efficiencies and alignment. These efforts will result in an accelerated new product development cycle and improved ability to introduce differentiated products, on time and on budget. "We thank both Alex and Tom for their leadership and their efforts in moving our Product Management group forward," said Sim Bielak, Chief Marketing Officer. "The successful introduction of new products is vital to SUZOHAPP's success and raising up a global leader in this area will streamline our efforts and introduce the level of global alignment required to get high quality new products in the hands of our customers faster." SUZOHAPP looks back at a successful BEGE that took place between the 22nd and 23th of November in Bulgaria. This edition was once again the hot spot for innovation and fruitful business contacts, bringing together many industry professionals. There was a greatturnout of manufacturers and operators who were interested in the vast SUZOHAPP offering on display and the gaming team was very pleased with the highly-qualified audience from the gaming industry. "BEGE has brought a fitting end to our show season," commented Amir Saluhovic, Regional Sales Manager. "We are proud to have supported the show as a Silver Sponsor. This is the 10th edition of the BEGE and the show grows in importance every year." Gaming is a multi-faceted industry and includes several categories, such as casino after-market, video lottery terminal (VLT) and amusement with prize (AWP). At BEGE, SUZOHAPP showed its rich selection of solutions for all these market segments, such as touch monitors and displays, bill & coin validators, pushbuttons, toppers and various cabinets' components. Each product segment was clearly displayed on the SUZOHAPP stand, making it easier for visitors to find what they were looking for. SUZOHAPP was able to impress visitors with its new PKT (Picture Key Technology) - the latest innovation in pushbuttons. They are fiber optic glass pushbuttons that present any graphic content from a display underneath the surface, with the tactile feel of mechanical pushbuttons. Through a patented technology, SUZOHAPP enables its clients to bring dynamic content via a highly configurable user interface. The latest VisionPRO and ELO monitors and LCDs were also the focus for many visitors to the SUZOHAPP stand. BEGE attendees appreciated seeing the latest cash handling innovations, specifically a selection of Comestero and SCAN COIN solutions, and a vast array of components such as banknote readers and recyclers, coin hoppers, and coin validators. The SH1950 LCD continues to be the top selling topper and visitors had the opportunity to see its new backlit version. Finally, casino equipment - locks and speakers were in high demand. SUZOHAPP is proud to announce its new partnership with Nanoptix, a global provider of technologies for the gaming, lottery, kiosk, POS and amusement markets. The new agreement involves the global distribution of all printing solutions from Nanoptix. 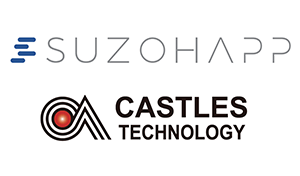 This new partnership reflects a new strategic direction for SUZOHAPP and represents its strong commitment to offer the most technologically advanced printing solutions. Nanoptix has over twenty years of experience in printing technology and has earned a reputation of excellent value and outstanding customer support, with superior technology at a very competitive price. Its strong experience and its top quality innovative solutions such as the PayCheck NextGen printer make Nanoptix the perfect partner for SUZOHAPP. "We are particularly proud of this new partnership" commented Goran Sovilj, Vice President of Sales Gaming EMEA for SUZOHAPP. "Nanoptix is a progressive and innovative manufacturer and represents the future of ticket printing technology. We are happy to provide our customers with the most current technology available in the marketplace and deliver quality and long-term value." "We were looking for an industry leader with a strong distribution network and outstanding service capability in the global gaming market" said Daniel Vienneau President & CEO of Nanoptix. "We believe that SUZOHAPP is the ideal partner for us and we are excited by the opportunity to work with them." "The fact that Nanoptix has chosen SUZOHAPP as a partner is a great endorsement of our distribution leadership. We look forward to a long and successful partnership", concluded John Archuleta, Director of Sales - Aftermarket Americas. SUZOHAPP will be exhibiting at the upcoming RBR Branch Transformation 2017 that will take place at the Royal Lancaster Hotel in London, between the 28th and 29th of November. The event is a conference and expo dedicated to branch strategy, helping banks shape, develop and perfect their branch transformation agendas. Inspiration comes from a host of innovative bank case studies, thought leadership from the industry's key strategists, extended networking breaks and an exhibition hall packed with the latest branch enhancing technology. 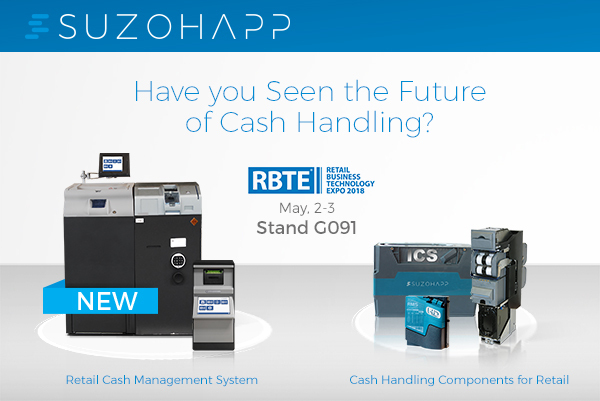 The RBR conference will be an excellent opportunity for SUZOHAPP to showcase a selection of SCAN COIN Cash Processing Solutions and its advanced software platform, CashComplete™ Connect. The focus will be placed on the innovative CDS-9R, the world's first self-service coin recycler designed to be used in a public environment. A completely new banking solution for coin deposit as well as coin dispense, the CDS-9R aims to inspire the industry and re-imagine current banking practices. It offers the most secure, reliable and effective way to handle self-service cash transactions, removing the need for costly coin roll dispensers and separate coin deposit machines. "Banks are under unprecedented pressure to manage costs and need optimized and secure solutions for cash management. We believe that handling cash should not be a time consuming issue and costly internal dispute, it should be a fast and efficient process with minimal human involvement," commented Walter ter Rahe, Vice President of Sales Banking EMEA. "Our new technology allows users to dramatically improve cash management at all levels and minimizes costs to the banks." "New technology is the underlying fundamental driver of branch transformation and our new CDS9-R is the right solution to transform coin handling into a completely automated process. It gives optimal accuracy, enabling you to meet the customer with the best service," added Steve Fitton, Sales Director of SCAN COIN UK. The European vending industry will meet in Rome, Italy at EVEX 2017 on the 23rd and 24th of November for two days of educational conferences, networking, exciting cultural activities and a commercial exhibition. 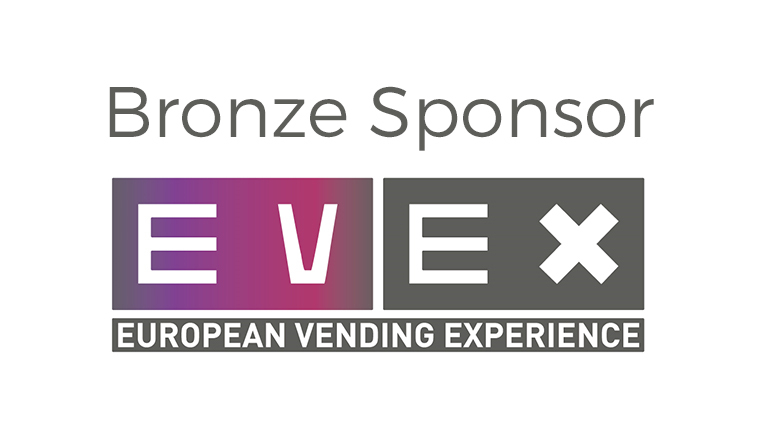 This year's EVEX will take place at the Radisson Blu Hotel in the heart of Rome and will be organized by the EVA (European Vending Association) in collaboration with Confida (Italian Vending Association). The Italian market is a driving force for the European vending industry with a high volume of major manufacturers and operators. EVEX will be the ideal opportunity for them to network and exchange information, contacts and experience. SUZOHAPP will be a Gold Sponsor at EVEX and all attendees will get a chance to learn more about its vast portfolio of cash and cashless payment systems. The entire SUZOHAPP Italian vending team will be attending EVEX. Marco Cantafora, Sales Manager for Italy, extends a warm welcome, stating, "We have an advanced product range and a strong team. We are the ideal partner to meet all the payment management needs of operators and manufacturers." "It is all about providing the right solution for the right application," added Luca Rossato, Sales Manager. "We always advise our customers how to make the best use of our products, while also providing technical training and maintenance / service. 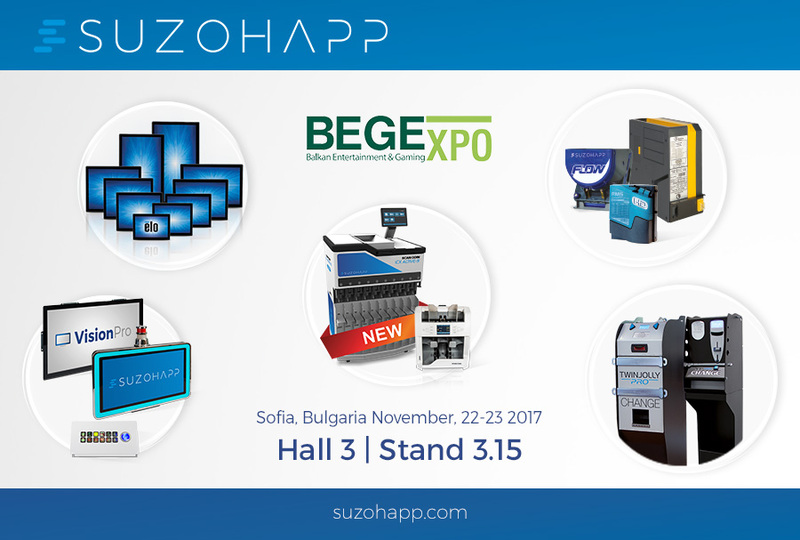 We are committed to supporting the vending industry and helping operators in their day-to-day business/"
The SUZOHAPP team sends out a warm welcome to all attendees of the upcoming BEGE Expo, the main gaming tradeshow in Eastern Europe that will take place between the 22nd and 23rd of November in Sofia, Bulgaria. With the slogan 'Bulgaria' - the technology hub of the Balkans', this year's BEGE highlights the fast-developing technological sector in the country. This year, the BEGE celebrates its 10th anniversary and SUZOHAPP is a Silver Sponsor. "We are proud to sponsor this must-attend show. BEGE is the best showcase to display our integrated solutions specifically designed for the Gaming market and, for this reason, our participation at this show is critical" stated Goran Sovilj, Vice President of Sales Gaming EMEA. SUZOHAPP is focused on creating technology that will lead the gaming industry toward tomorrow's solutions. At this year's BEGE, SUZOHAPP will show an outstanding innovation? the new PKT (Picture Key Technology) push buttons. This is leading-edge technology in tactile controls, combining SUZOHAPP's key capabilities in push buttons, displays and RGB LED design to create an innovative all-in-one solution. Through a patented technology, SUZOHAPP enables its clients to bring dynamic content via a highly configurable user interface. Game designers are no longer limited by the user interface and end users now receive eye-popping content through a tactile button, creating a more rewarding and comforting experience. In the SUZOHAPP booth, significant focus will also be placed on monitors and LCD?s, featuring ELO touchscreens as well as SUZOHAPP's own VisionPro monitors. A vast selection of toppers will be displayed, including the top-selling SH1950 LCD Video Topper, now available in a backlit version, as well as the RBG Pill, the Xenon RGB and the Ellipse toppers. Cash handling equipment is a prominent offering in the SUZOHAPP portfolio and a broad range of components for manufacturers will be showcased at BEGE. These include Comestero coin validators (RM5 HD) and banknote validators (MFL and SC Advance), bill recyclers (Bill-to-Bill) and coin hoppers (Flow, Cube and Evolution). SUZOHAPP will be exhibiting at the upcoming Macau Gaming Show (MGS) that will take place between the 14th and 16th of November. Macau is the largest gaming and entertainment market in the world and the MGS is the voice of this important market. 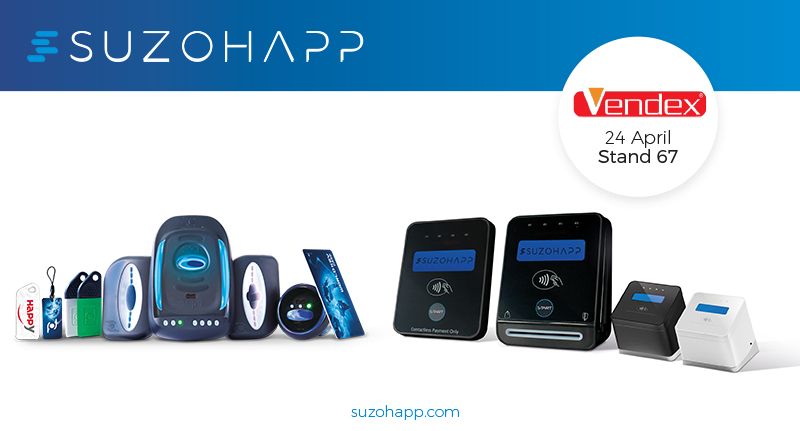 The SUZOHAPP team is looking forward to welcoming visitors at Booth #A029 and showcasing a selection of its vast product range. The MGS will be an excellent opportunity for SUZOHAPP to proudly introduce its latest innovation - the 27" Pedestal Kiosk. A brand new upright kiosk with a slim, contemporary design, 27" touchscreen display and optional customization for a printed wrap to showcase company and loyalty reward themes. Other advanced solutions on exhibit include the 27" Dual Sided LCD Display with LED and the Display Pro. With its stylish design, the Dual Sided LCD Display is perfect for table games applications and other casino uses and is a great way to share content, catching customers coming and going. The Display Pro digital sign, featuring a 42" FHD commercial rated screen which is ideal for visual campaigns, can replace untidy posters and older backlit sign boxes. In the SUZOHAPP booth, great focus will be placed on the PKT Button Panel. The PKT is the leading-edge technology in tactile controls. Through a patented technology, SUZOHAPP enables its clients to bring dynamic content via a highly configurable user interface. Game designers are no longer limited by the user interface and end users now receive eye-popping content through a tactile button, creating a more rewarding and comforting experience. SUZOHAPP took a prominent position at Vendiberica in Madrid between the 18th and 20th of October. "Vendiberica was an excellent show! The market is rewarding our innovative approach and strong customer support." stated Luis Fernandez, SUZOHAPP Sales Manager in Spain. Next week, SUZOHAPP hopes to recreate their strong performance at Vendiberica by exhibiting at Vendex North, the premier event for the UK vending industry that will take place in Manchester on 7th November. For coin recycling technology, SUZOHAPP will display its 6-tube Currenza C², the only solution in the market with Payout Redundancy Protection (PRP). The PRP technology incorporates 3 separate motors to reduce downtime and guarantee continued coin pay-out security. For applications where only coin-in is required, the Comestero RM5 electronic coin validator is the ideal solution, with its over one and a half million units sold worldwide. For cashless payment technology, the WorldKey solutions will be the biggest highlight on the stand. WorldKey is the most complete cashless range in the market thanks to 5 different models to satisfy the specific needs of operators and 3 reading heads able to accept keys, cards, tags and stickers in a secure and easy way. Visitors will learn more about the WorldKey Loyalty platform, an on-line solution that allows operators to communicate directly with end users and develop loyalty programs. Furthermore, SUZOHAPP will showcase the P68 cashless payment terminal that has been specifically developed for the vending industry. The P6 series is fully compatible with the WorldKey cashless range and promises faster transactions of between only 3 to 5 seconds. Payment can be made using contactless, chip or magnetic stripe, as well as through a smartphone using Apple Pay or Samsung Pay. Finally, a significant focus will be put on the SCAN COIN back-office solutions, including the DTC-9 coin sorter and the SC-8220 multi-currency banknote counter. "We appreciate the wave of great feedback from the Spanish tradeshow! We are looking forward to welcoming all Vendex attendees at Booth F15." commented Nick Norris, Sales and Technical Manager UK and Ireland at SUZOHAPP. SUZOHAPP is ready for the upcoming IAAPA Attractions Expo, the largest international tradeshow for the amusements and attractions industry. IAAPA will take place at the Orange County Convention Center in Orlando, Florida, from November 14th through November 17th. Visitors can find the industry-leading range of amusement machine components and cash handling solutions at SUZOHAPP Booth #1719. These include a wide array of controls, monitors, lighting, speakers, hoppers, coin mechanisms and complete front-desk and back-office cash handling solutions. Buttons and joysticks are essential on every amusement machine and SUZOHAPP continues to invest in this control technology. A rich assortment of control solutions will be displayed at IAAPA, including the Aura Button, the Jumbo IPB, the Illuminated Arcade Buttons, the Standard IPB and the Bubble Joysticks. 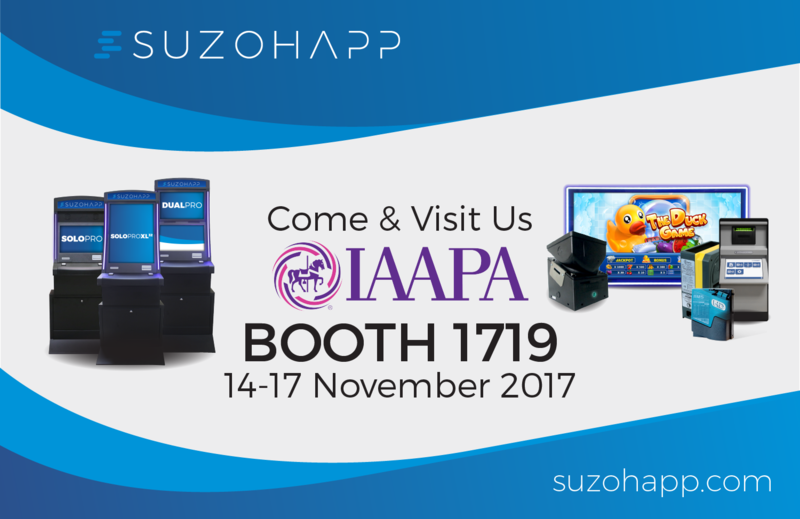 Monitors and touch screens enable players to interact with the amusement machines and, at IAAPA, SUZOHAPP will showcase its VisionPro line. SUZOHAPP will also show its wide range of SAS speakers and Lighting solutions, including the LED Tube lights and the Assorted LED lights. One of the biggest highlights in the SUZOHAPP booth will be the Solo Pro XL32 cabinet, the ideal solution for game developers. The Solo Pro XL32 is a new customizable cabinet featuring a single 32" vertical LCD touch screen. Game developers simply plug in their game board to have a complete slot machine solution. SUZOHAPP is extremely satisfied with the outcome of this year?s G2E. This tradeshow was the ideal opportunity to demonstrate its leading position in providing value-added technology to the market. There was a great turnout of OEMs and casino operators who were very interested in the specific solutions designed by SUZOHAPP to meet their unique requirements. For monitors and LCDs, the VisionPRO and ELO solutions were under the spotlight and visitors had the opportunity to learn more about the new LED edge-lit monitors and the dual-sided monitors. One of the biggest highlights was the vast selection of buttons on display, including the innovative Picture Key Technology (PKT) pushbutton solution which attracted the attention of many gaming machine manufacturers. SUZOHAPP is a licensed provider of PKT which enables dynamic content within a tactile surface. SUZOHAPP is also an exclusive distributor of Optec Displays and, at G2E, there was a strong focus on Optec?s impressive new type of casino signage made from LED arrays. Known worldwide for its hoppers and toppers, SUZOHAPP showcased its best sellers in Las Vegas - the Flow, Evolution and Cube hoppers, as well as the SH1950 video topper. 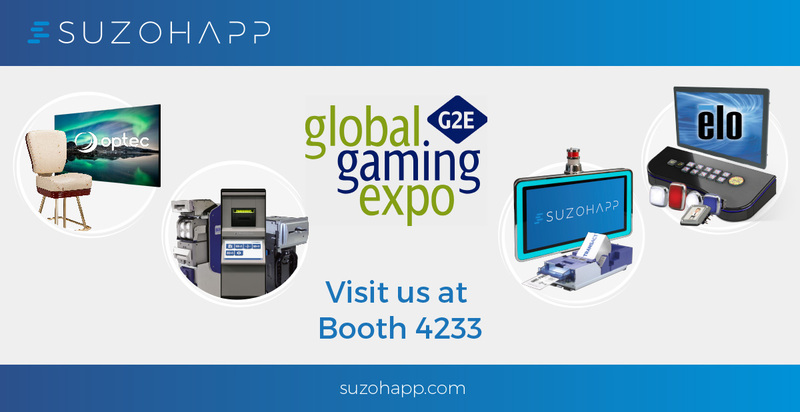 SUZOHAPP is also the specialist for casino applications and, at this year?s G2E, its extensive portfolio of components and accessories were proudly displayed. Operators appreciated seeing the wide array of joysticks, locks, speakers, video cards and LED tube lights, and the new LED lighted USB Chargers. Further components, such as coin validators and banknote readers and recyclers, were also in high demand at the show. "We received exciting feedback from OEMs and casino operators," explains Ron Partridge, President of SUZOHAPP Americas. "Today we are recognized as a major innovator, offering complete development and manufacturing capabilities. At G2E, we proved again to be the one-stop-shop for the industry. Furthermore, we are increasing our footprint in the cash handling sector"
SUZOHAPP is exhibiting at Equip?Auto which is taking place at Paris Porte de Versailles between the 17th and 21st of October. At the SUZOHAPP stand #1S019, the focus is on the innovative PRO product line of Comestero starters and changers, the ideal solution for any modern self-service car wash station.
? 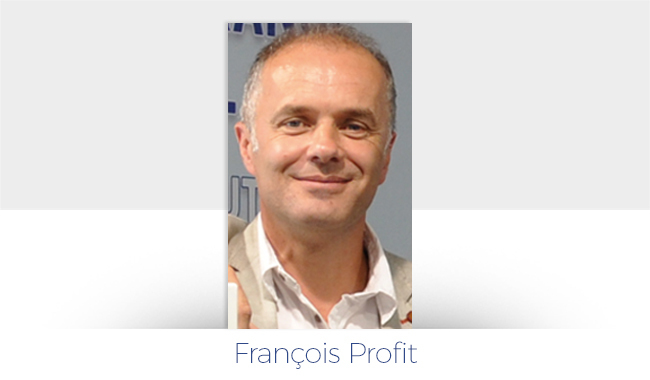 "he PRO line," comments François Profit, Vice President of Industrial EMEA, "is equipped with the latest generation payment systems and provides a wide configuration choice to satisfy the different needs in the market. Our machines are based on an advanced PC architecture and offer a user-friendly experience, thanks to the 5" or 10" touchscreens and the vocal guide.". The PRO line includes the Multi PRO, a revolutionary outdoor money changer and starter for car wash portals. With a practical 5" touch screen and a vocal guide, Multi PRO allows the user to quickly manage multiple tasks, such as starting the programs, recharging cards and keys, changing money, buying tokens and distributing cards or keys. Pit PRO is designed to be resistant to dust, water splashes and sprayed chemicals due to its new heavy-duty structure. It manages up to 8 different washing programs, changes money or tokens and recharges keys or cards. Touch PRO is a centralized cash point and a truly automated car wash service support. Furthermore, it is a powerful marketing tool, allowing the operator to increase daily business. It can manage up to 8 washing programs and allows cash payment as well as payment with tokens, cards, keys and credit cards. It can also manage mobile payments. "At Equip&apos;auto, we are very proud to present our partner, Kleen. They created an innovative app specifically designed for car wash stations. Users can download the app from Google Play or from the Apple Store," explains François Profit. "Thanks to Kleen, users can choose the car wash station in a defined area using geolocalisation and can select their favorite washing program and its price. Then they can buy the selected washing program and receive a QR-code which can be used in the car wash station by simply scanning it on the Touch PRO." 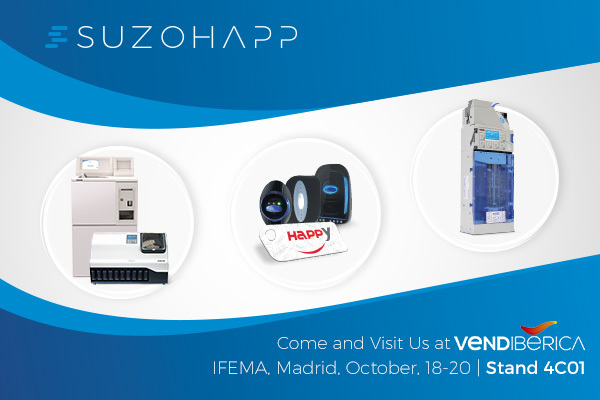 SUZOHAPP sends out a warm welcome to attendees of the upcoming Vendiberica that will take place at the IFEMA exhibition center in Madrid between the 18th and 20th of October. SUZOHAPP will be showing its vast selection of solutions for cash and cashless management at Stand 4 C01. In coin handling, the focus will be on the Currenza C² coin recycler, which is a household name in the industry with its array of unique benefits. Thanks to the PRP (Payout Redundancy Protection) system, six tubes and three independent motors, it reduces downtime and guarantees maximum security in every application. For vending applications where only coin acceptance is required (for example, table-top vending machines), the Comestero RM5 coin validator is the ideal solution. With over one and a half million units sold worldwide, it ensures optimal acceptance of true coins and rejection of false or fraudulent coins, as well as maximum security against any possible manipulation attempts. SUZOHAPP has an ever-growing range of cashless payment solutions. WorldKey is the most complete and reliable cashless line in the market. It offers many new features, such as Age Detector, Day Free Vend, wallet expiration, QR code reader and credit card reloading. The WorldKey range continues to expand and today SUZOHAPP is proud to offer the new WorldKey Loyalty platform, the online solution that allows operators to communicate directly with end users and develop loyalty programs. SUZOHAPP expertise in cashless solutions will also be highlighted through the P6 series which is the latest generation of credit & debit card payment terminals for vending applications. These advanced devices enable payment using contactless, chip or magnetic stripe, as well through a smartphone using Apple Pay or Samsung Pay. 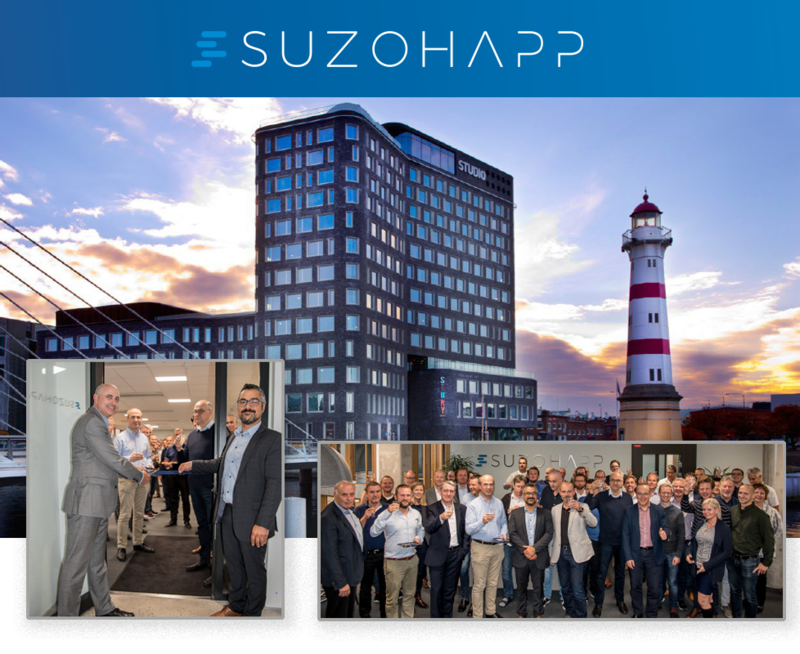 SUZOHAPP is proud to announce the opening of its new Swedish facility in Malmö, Sweden. The new site is situated in the Business District in Malmö Central and is located on the fifth floor in the newly-constructed building named "Studio", a modern space with distinctive architecture and design elements. The new property is about 1100 square miles and houses seventy employees, including SUZOHAPP Technology Services (STS) Engineers, Product Managers, Market Support, as well as Customer Service, Finance and IT. The Swedish site hosts the SUZOHAPP EMA Technology Hub which is the largest global technology center within the group. 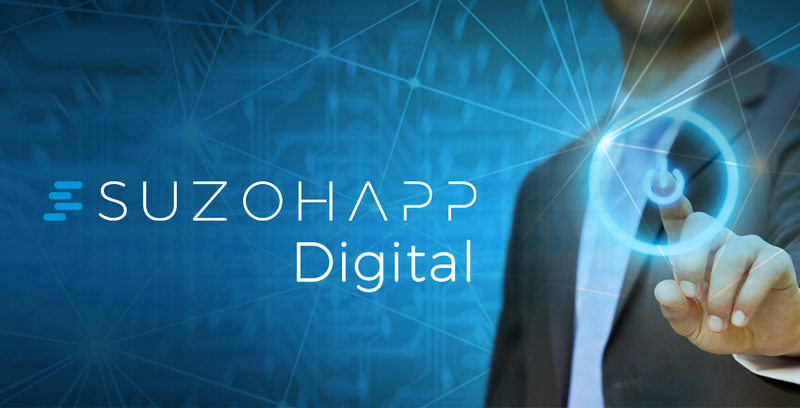 "This is another important milestone in transforming SUZOHAPP into a true technology company,? explained Wilbert Bieleman, EMA Managing Director. ?We consider R&D a fundamental part of our success, so we invest a lot in people and facilities, such as this new Technology Center. Our goal is to continue to innovate and provide the market with tomorrow's solutions." "We are all excited about our new facility. It is a very productive environment for our employees and will create new opportunities for successful collaboration,? commented Alexander Bucur, Entity Leader in Sweden. "We are very happy about our new Technology Center which strengthens Malmö as a strategic location within SUZOHAPP." In a few weeks, SUZOHAPP will open a second site in Malmö Ollebo which will host the Scandinavian Sales and Service Team, as well as a fully equipped mechanical workshop for prototypes and concept machines used for STS and product management developments. SUZOHAPP looks back at a very busy Euro Attractions Show (EAS) that took place between the 26th and 28th of September in Berlin. There was a great turnout of Amusement professionals who were interested in the vast offering on display at the SUZOHAPP booth. 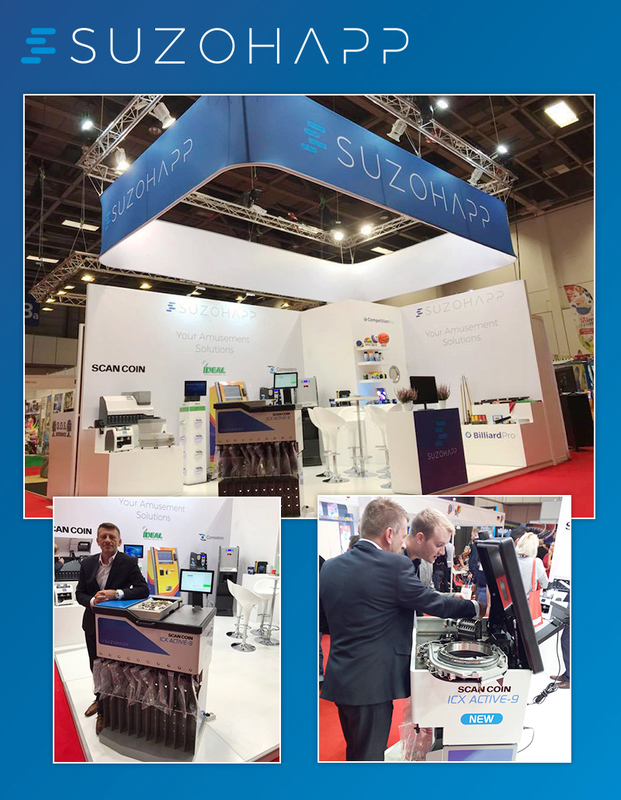 The German show was the ideal opportunity for SUZOHAPP to launch the new ICX Active-9, the innovative SCAN COIN mid-range compact coin sorter. 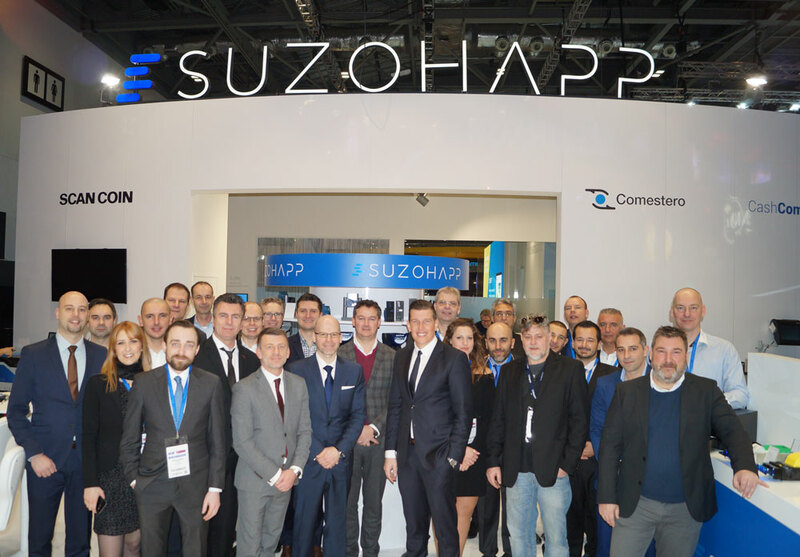 John Vallis, Sales Director for SUZOHAPP in the UK and Vice President of Amusement Sales EMEA, commented, "We were very pleased with the great feedback we received from the visitors to our stand. We have introduced a high-volume coin sorter that is exactly what the market has been looking for. Through years of research, development, testing and industry trials, the ICX Active-9 is engineered to be the best at delivering what any coin sorter should - accuracy and consistency." For operators of amusement parks, SUZOHAPP displayed the IDEAL solution. The IDEAL Cashless System can transform the amusement facility into a fully integrated operation with greater profitability and an enhanced guest experience that will keep customers coming back for more. IDEAL enables a common cashless payment system for customers at locations offering a multitude of attractions, as well as amusement machines, bowling alleys, food and beverage, just to name a few. IDEAL is card-based with various card reading possibilities, making the solution very user-friendly. Customers can pay using the IDEAL cards anywhere in the location. The card can be dispensed and/or recharged at the self-serve kiosk or from a POS terminal. ?It is all about providing the right solution for the right application,? added Luca Rossato, Sales Manager. ?We always advise our customers how to make the best use of our products, while also providing technical training and maintenance / service. We are committed to supporting the vending industry and helping operators in their day-to-day business/"
The Global Gaming Expo (G2E) is the must-attend show in the gaming-entertainment industry. This year?s event will be held between the 3rd and 5th of October at the Sands Expo Convention Center in Las Vegas. SUZOHAPP is committed to supporting the gaming industry and will be located at booth #4233. At G2E, SUZOHAPP will proudly display its advanced solutions created and designed for OEMs and will show how tomorrow?s ideas can be turned into today?s reality. SUZOHAPP is always ready to meet the unique requirements of OEMs. Coin hoppers, toppers and push buttons are three examples where SUZOHAPP has applied its expertise to create industry-leading solutions. "This is what has made SUZOHAPP the company it is today," explains Ron Partridge, President of SUZOHAPP Americas. "We offer OEMs complete vertical integration from product design to production, and after-sales service and support. Our team has the development and manufacturing capabilities to produce innovative, OEM-specific solutions." In the SUZOHAPP booth, significant focus will be placed on monitors and LCD?s, featuring ELO touchscreens as well as SUZOHAPP?s own Vision PRO monitors, including new LED edge-lit monitors and innovative dual-sided monitors. Visitors will have the opportunity to see a variety of buttons which suit any customer?s needs. Mechanical Halo buttons, chrome buttons, TFT buttons, touch deck and Aura buttons will be showcased and the innovative Picture Key Technology (PKT) pushbutton solution will be in the spotlight. SUZOHAPP provides the right solution for all casino applications, making it the perfect partner for gaming operators, too. SUZOHAPP offers a rich selection of components and at G2E will be showing joysticks, locks, speakers, video cards, LED Tube lights and new LED lighted USB Chargers. The top selling SH1950 Video Topper, now available in a backlit version, will be highlighted, as will TransAct printer solutions. To read the full article, download the Press Release below. The Coach & Bus show is the UK?s premium coach, bus and accessibility exhibition, featuring the most innovative solutions for the UK market. 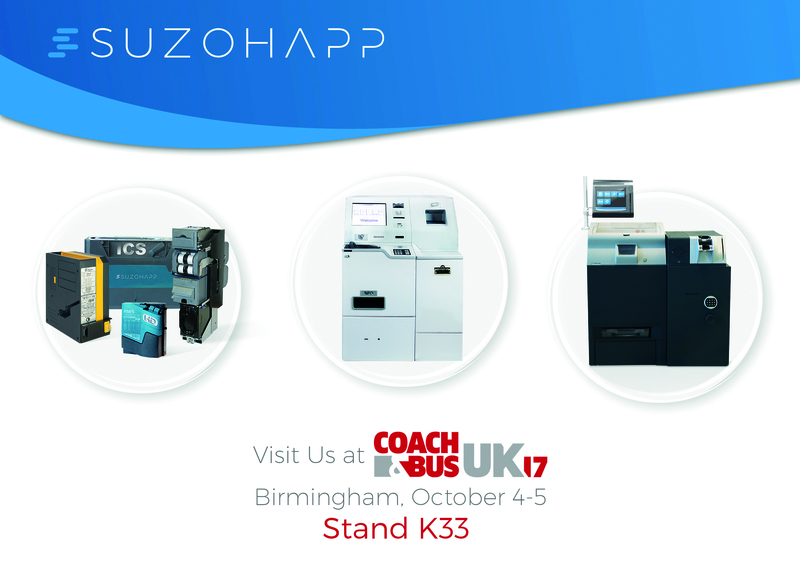 The event will open its doors in Birmingham on October 4 & 5 and SUZOHAPP will be exhibiting at Stand #K33. The Coach & Bus show is the perfect place to present best-in-class SCAN COIN solutions, such as the CDS-9 with note sidecar, suitable to manage the driver?s coins, banknotes and tokens in a convenient, secure and efficient way. Data from field operation shows that the CDS-9 can increase profitability. For example, an operator running 100 drivers can gain 16 man-hours per day. The real-time online link enables operators to have immediate access to all information. Operators looking for the latest technology in banknote counting will enjoy seeing the SCAN COIN K2. This high quality counter can process up to 1,000 notes a minute and can be programmed for up to 7 different currencies. It uses the very latest sensor technology to ensure that only valid notes are counted and the 4.3" display makes it simple to use. Any updates (e.g. new notes) are done simply via the USB port. There will be a strong array of cash handling technology on display in the SUZOHAPP booth and visitors will also have the opportunity to learn more about the features and benefits of the CashComplete™ RCS-400 alongside the SDM-504S. This complete solution provides coin and note sorting and dispensing, as well as storage for pick-up by CIT companies. The RCS-400 offers a high recycling capacity of 16,000 coins for 8 denominations - it is the perfect solution to dispense floats and it can dole out up to 2,400 coins per minute into a cash drawer. Manufacturers of ticketing machines can also find best-in-class cash handling equipment at the Coach & Bus show. 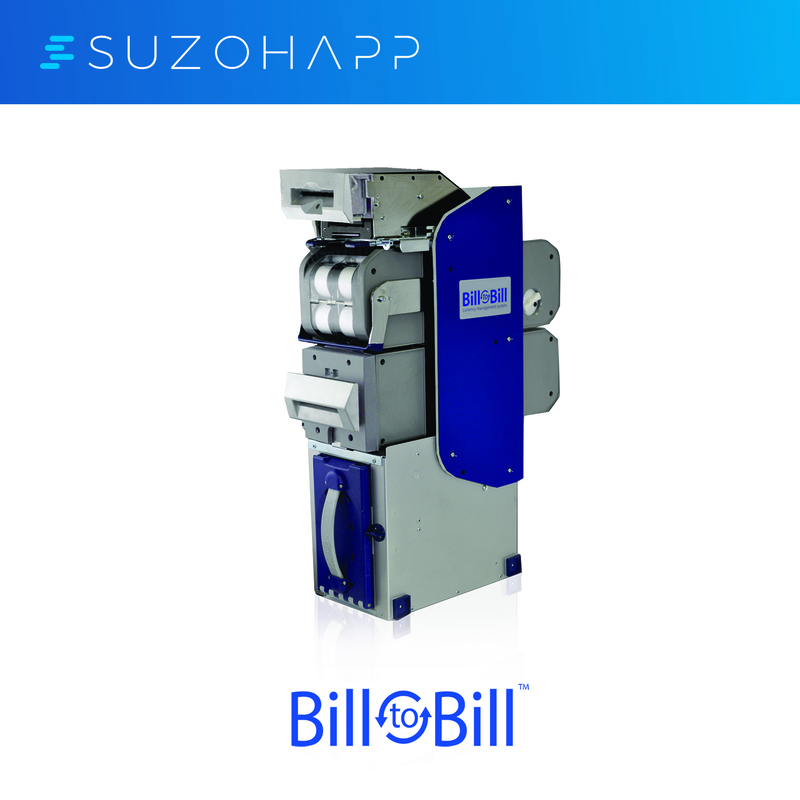 SUZOHAPP will be showing its banknote recycler, Bill-to-Bill 300, which has the storage capacity to recycle up to 300 banknotes in three different denominations. Other components on exhibit include the Comestero RM5, which is the answer for electronic coin validation, coin hoppers and WGR coin carrousel. Today the Board of Directors for SUZOHAPP announced the departure of Colombo Fasano, the Managing Director of its Cash Automation Solutions business in Europe, the Middle East, and Africa (?EMA Solutions?). Fasano will be leaving SUZOHAPP in mid-October. When SUZOHAPP purchased SCAN COIN in 2015, Fasano took the leadership role for SCAN COIN as it became a division within SUZOHAPP. As the two companies began the integration process, he filled a critical role in both leading the transition and giving software a central role in the SUZOHAPP solution portfolio. Over time, he helped grow SUZOHAPP?s Solutions business in the retail sector, supporting the company?s strategy to become the premier provider of retail cash automation solutions. Matt Brown, President & CFO of SUZOHAPP, expressed gratitude for Mr. Fasano?s contributions. "We are grateful for the way Colombo brought the organization forward. He approached every decision with a laser-like focus on our customers. He was their strongest advocate" said Brown. "Colombo leaves us having developed a successful base from which we can take this group to the next level." SUZOHAPP will continue to build on this success with the help of Wilbert Bieleman. Bieleman will take over the Solutions division in EMA (i.e., the SCAN COIN business) effective October 13, 2017. Having joined SUZOHAPP in May, Bieleman took leadership over the company?s Components Division in EMA. Moving forward, he will oversee both Solutions & Components and will lead one united EMA Region as Managing Director of all EMA. "We are confident that Wilbert is the right person to lead SUZOHAPP EMA into the future,? said Brown. "In just a few months time, he has already made a significant impact on our Components business and I expect the same on the Solutions side. I am grateful to both Wilbert and Colombo for working so collaboratively to ensure a complete and smooth transition that will benefit our employees and our customers." The Euro Attractions Show (EAS) is the premier event for the leisure, attractions, tourism, and entertainment industry, organized by the International Association of Amusement Parks and Attractions (IAAPA). This year the tradeshow will be taking place between the 26th and 28th of September in Berlin, Germany, and SUZOHAPP will be exhibiting at Stand 310, Hall 23. At this year?s EAS, great focus will be placed on the SCAN COIN back-office cash handling solutions. SUZOHAPP is inviting visitors to experience the ICX Active-9, the brand new strong and compact active coin sorter launched for the first time in the amusement market at EAS. This innovative product represents the new mid-range class of sorters and leverages best-in-class technology from the ICP Active-9 that has become the benchmark for high volume sorters. The SCAN COIN solutions on show also include the DTC-9, SC-360 and the SC-8220. Operators can choose the product that best serves their needs according to the amount of cash they have to handle. Operators often need to offer their customers the possibility to change their money to play on the machines. SUZOHAPP is the expert in money changing technology with its Comestero solutions. At EAS, the Dual Coin PRO and the Twin Jolly PRO, the best-selling change machines in the industry, will be displayed. Other solutions on exhibit include a selection from BilliardPRO and CompetitionPRO product lines. BilliardPRO covers a wide range of billiard and snooker requirements, including wooden cues, fiberglass cues, slip-on and screw-on tips, billiard and snooker balls, table cloths from a range of premium suppliers, scoreboards, triangles and even a UK-made dowsing iron. The CompetitionPRO brand consists of a large array of solutions and dedicated spare parts, including redemption tickets and dispensers, air hockey parts, mallets and basketballs. 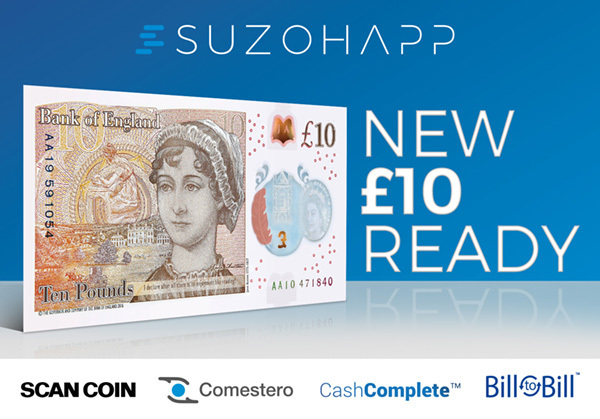 SUZOHAPP is well prepared for the new £10 banknote that will enter circulation in England and Wales on Thursday 14th September. All banknote readers and recyclers, SCAN COIN and CashComplete solutions are ready to accept the new £10. The new British £10 represents the very latest in banknote technology. As it is made of polymer, it is cleaner, safer and stronger than paper notes. It joins the Churchill £5 in the first family of polymer Bank of England banknotes. A new £20 note featuring J.M.W Turner will follow in 2020. The new £10 banknote is 15% smaller than the current £10 and has a number of special security features, such as a see-through window, foils that change color when the note is tilted and a built-in ultra-violet feature. The new £10 note features the Queen on the front and Jane Austin, one of Britain?s most-loved authors, on the reverse. 2017 marks the 200th anniversary of Austin?s death. SUZOHAPP commits to providing its customers with the necessary software and hardware updates to upgrade their machines and devices. The Bill-to-Bill? note recyclers and MFL? bill validators are ready to accept the new banknote through a simple software update. The Comestero solutions are also prepared to accept the new £10. "The updating procedures are quick and simple," stated John Vallis, Sales Director for SUZOHAPP in the UK and Vice President of Amusement Sales EMEA. "Many customers replaced or upgraded their note acceptors for the new £5 banknote last year, so their equipment will be easily upgradable to the new £10 by using a programming kit. Any customers needing to upgrade their equipment to accept the new £5 or £10 banknotes should contact the UK sales team for advice and support." AVEX is the UK?s leading exhibition for the vending and coffee industries, providing a platform for the display of the latest technology, product development and innovation from all sectors of these industries. This year, AVEX will take place in Birmingham between the 12th and 13th of September. SUZOHAPP will be showing its solutions for cash and cashless management at Stand 211. The focus will be on the Currenza C² that is the benchmark product in the vending industry for coin acceptance and recycling technology. Thanks to the PRP (Payout Redundancy Protection) system, six tubes and three independent motors, the Currenza C² reduces downtime and guarantees maximum security in every application. The Currenza C² is implemented when operators wish to offer change-giving. When there is no need to pay back change - for example, in table-top vending machines - SUZOHAPP offers the Comestero RM5 electronic coin validator. With over one and a half million units sold worldwide, the RM5 is trusted by Vending operators for its proven quality and reliability. In cashless payment technology, SUZOHAPP provides the WorldKey solution, the most complete and reliable cashless range in the market. It offers many new functionalities, such as Age Detector, Day Free Vend, wallet expiration, QR code reader and credit card reloading. WorldKey customers can furthermore benefit from the innovative WorldKey Loyalty platform, the new online solution that allows operators to communicate directly with end users and develop loyalty programs. Operators can thus plan one-to-one campaigns via email based on the behaviors and habits of their customers. The results are increased turnover and more satisfied customers through customized promotions. 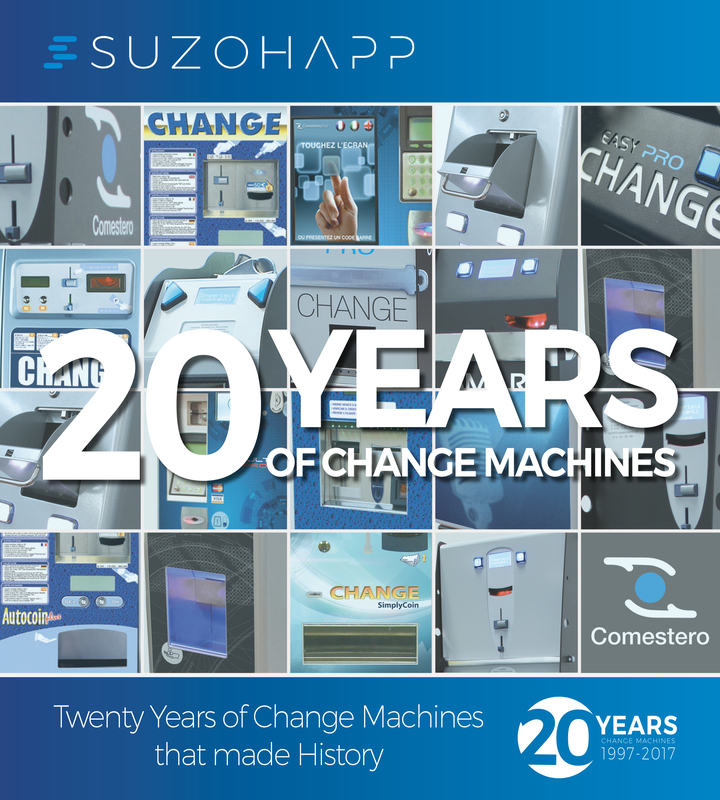 This year marks the 20th anniversary of the Comestero change machine brand and SUZOHAPP is proud to celebrate this important milestone, the result of years spent understanding customer needs and converting them into the right solutions. This has been the foundation for the Comestero change machine success. "The Comestero brand equals change machines and these machines play a key role in our portfolio at SUZOHAPP. This brand represents our top-of-the-range offering alongside SCAN COIN, CashComplete, Currenza C² and Bill-to-Bill," comments Wilbert Bieleman, President and Managing Director of SUZOHAPP?s EMA Components Division. The first Comestero change machine was launched in Italy in 1997. ?We?ve been pioneers in this technology for twenty years now. We are well known for our commitment, our passion and strong focus on creating solutions that mirror customer needs,? explains Piero Martellotta, Gaming Sales Director in Italy. The first models in 1997 were the SimplyCoin and the MultiCoin, the forerunners of modern change machines. Easy Change followed a year later. The simplicity and flexibility of this change machine drove its international success. The need to provide change machines for outdoor applications was solved in 1999 with the introduction of Simply Inox which was recognized for its high level of protection against adverse weather conditions. Further successful models followed, yet 2009 marked a new era in change machine quality and design with the introduction of the innovative PRO range (Easy PRO, Jolly PRO, Dual Coin PRO and Twin Jolly PRO), developed to raise the bar in terms of functionality and application. Meanwhile, the gaming market evolved and the need for banknote recycling within change machines arose. Swing was introduced in 2012 offering two-way money change - from banknotes to coins and from coins to banknotes - in just a few seconds and ensuring recharge autonomy and simple maintenance. Furthermore, a new cabinet design guaranteed robustness and security alongside a high-security lock and upgraded closing mechanisms. Namco Funscape is a popular family attraction that hosts a wealth of indoor family activities, such as bowling, games, pool and dodgems, to name just a few. Each visit promises hours of fun. Given the volume of transactions made throughout the facility, it is a challenge for the management to quickly and accurately process coins and tokens each and every day. Namco Funscape at the Trafford Centre in Manchester leverages the SCAN COIN ICP Active-9 from SUZOHAPP to optimally manage their coins and tokens. The SCAN COIN ICP Active-9 is the only sorter in the market that can sort 9 different denominations into separate bags. It makes use of advanced sensor technology to provide fast, accurate and versatile coin sorting. Furthermore, invalid / fraudulent coins or tokens are always rejected. This latest generation coin sorter states exactly what it does in its name - Intelligent Coin Processing: ICP. It is designed to be user-friendly and reliable, thus ensuring optimal operational uptime. The custom configuration program enables operators to simply change the coin sorting program and thus stipulate which types of coins / tokens are sorted into which bags. Tommy Nasser, General Manager of Namco Funscape, highlights the benefits of the ICP Active-9, "This is an extremely reliable product and the coin sorting speed is fantastic. The installation and training were exemplary. The ICP Active-9 is simple to use and its speed saves us valuable time. The ICP Active-9 fits to our needs perfectly." John Vallis, Sales Director for SUZOHAPP in the UK and Vice President of Amusement Sales EMEA, adds, "The ICP Active-9 is the toughest sorter in the business. This is because its robust, cast-iron base was developed in conjunction with makers of castings for Formula One racing. This is the single biggest reason why the ICP Active-9 can continuously and reliably process over one million coins per shift." The Australasian Gaming Expo (AGE) is set to open its doors in Sydney, Australia, between the 15th and 17th of August and SUZOHAPP will be exhibiting on Stand 470. This year the Exhibition slogan is "The Future is Here" which perfectly fits with SUZOHAPP&apos;s approach to business. At this year&apos;s AGE, SUZOHAPP will be showing how gaming manufacturers and operators can take the future of gaming into their own hands thanks to SUZOHAPP solutions. SUZOHAPP provides the right solution for all applications in a hotel, club or casino. At this AGE show, SUZOHAPP will highlight the Loyalty Kiosk, integrated with a number of Loyalty system providers and POS companies, and the DisplayPro digital sign, featuring a 42" FHD commercial rated screen which is ideal for visual campaigns, replacing untidy posters and older back light sign boxes. The Dual Sided LCD Displays, perfect for table games applications and other casino uses, will also be in the spotlight. The future of interactive table gaming is called InteractivePro™ Table, the solution which offers a unique 10-point multi-touch experience suitable for a wide range of applications, excellent for television, video and interactive entertainment in bars, casino floors, restaurants and lounges. SUZOHAPP will also show its wall mounted version, the BoothTV, which can host a number of different applications and be used by more than one person at a time to utilize or interact with a system, including video and browser applications. 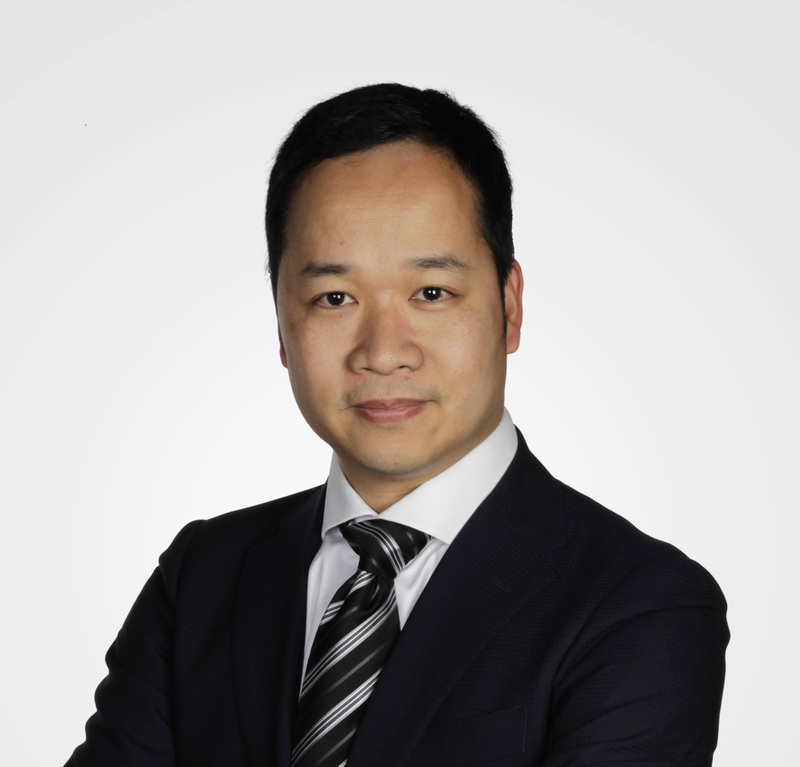 SUZOHAPP is pleased to announce the appointment of Allen Ko as Vice President OEM ? Cash Handling for the Asia Pacific region. "I am excited to have the chance to lead a high performing team in Asia Pacific. The opportunities abound and our innovative products provide for so many solutions here. We will open new markets and grow the OEM and cash solution business across the region, especially the China market. We have a lot of work to do and foresee a very positive future," commented Allen Ko. "Allen, Jessica and Raymond make up an excellent team and we are very excited about the opportunities in the OEM market in the Asia Pacific region,? stated Geoff McDowell, SUZOHAPP APA Managing Director. ?We welcome them all to our growing SUZOHAPP team and wish them much success." SUZOHAPP is pleased to announce the appointment of Evrim Özsoy as Vice President of Retail Sales for its EMA Components Division. Evrim brings with her a 13-year track record of success in leadership and sales. Before joining SUZOHAPP, Evrim led teams and delivered outstanding results as Country Sales Manager at Diebold and as Account Manager at NCR. Her extensive experience, coupled with her degree in Electronic Engineering, gives her a significant amount of in-depth knowledge of the industry. At SUZOHAPP, her primary role will be to grow the Retail business for the EMA Components Division by defining strategy and leading the sales team to achieve its goals. Evrim will report to Wilbert Bieleman, President and Managing Director of SUZOHAPP&apos;s EMA Components Division. 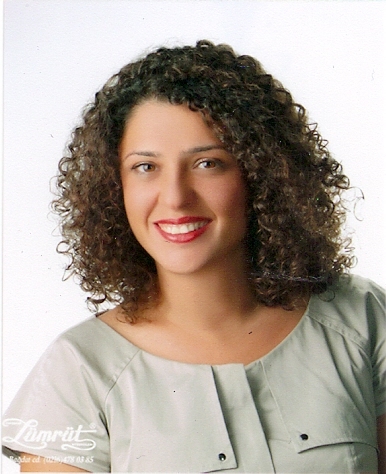 "We are very pleased to welcome Evrim to the SUZOHAPP team. With her strong leadership and extensive experience, Evrim is a valuable addition to our team and will play a central role in the strategic growth of our Retail business," stated Wilbert Bieleman. Evrim commented, "I am excited to take on this exciting and challenging new role. I look forward to being part of such a dedicated team and contributing to the company&apos;s growth and success." Evrim Özsoy succeeds Eric La Franca who formerly filled this role. "We thank Eric for the significant contribution he made to the development of our Retail market. With Eric handing over his responsibilities and tasks to Evrim, we are confident in a smooth transition of the role," concluded Mr. Bieleman. ¡Hemos ganado el premio innovación! The ATMIA "ATM and Cash Innovation" Conference took place on June 13 & 14 in London. This edition celebrated the 50th anniversary of the ATM industry which has revolutionized financial services, access to cash and human spending habits. At the Celebratory Gala Dinner, the first 50 years and the future of ATMs were commemorated and awards were given to organizations that made unique contributions to the development of the ATM industry over the years. SUZOHAPP received the Silver Innovation Award for its innovative Cash Recycling Technology, thanks to SCAN COIN solutions. "We are honored to receive this prestigious award as recognition of our ongoing dedication and commitment to the industry," explained Walter ter Rahe, Vice President of Sales Banking EMEA. "This award is an amazing achievement for us. We are always focused on bringing innovations to the industry and our Recycling Cash Solutions ensure a quick return on investment through improved cash management," added Jim Anderson, Managing Director of SCAN COIN UK. At the event, a selection of SCAN COIN cash processing solutions and their sophisticated software platform were successfully displayed. The biggest highlight was the innovative CDS-9R, the world&apos;s first self-service coin recycler for public environments, which offers the most secure and effective way to handle cash transactions, removing the need for costly coin roll dispensers and separate coin deposit machines. "The CDS9-R transforms customers&apos; coin handling into a completely automated process and minimizes costs to the banks. Thanks to our new solution, you can take control of your cash through an efficient cash cycle in all areas of your business, from internal cash handling to CIT operations," concluded Walter ter Rahe. WorldKey Loyalty entre los finalistas en la categoría ?Payment System of the Year? 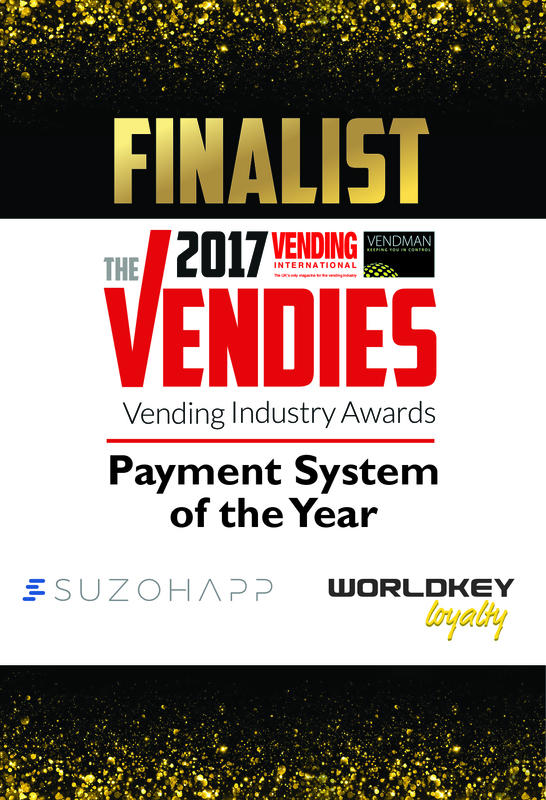 The Vendies, formally the Vending Industry Awards, is the prestigious awards program for the Vending industry, designed to recognize and reward the success, innovation and technology of the past twelve months. 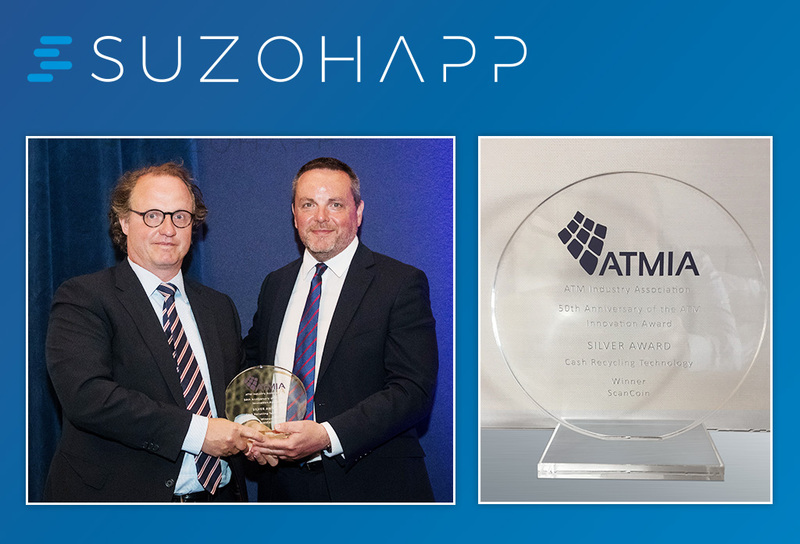 Two years ago, SUZOHAPP won the &apos;Best Payment System&apos; category thanks to its Currenza C² that has set the benchmark for coin acceptance and recycling technology. This year, SUZOHAPP has been nominated in the &apos;Payment System of the Year&apos; category for its WorldKey Loyalty which has been recognized as a major innovation in the field of cashless payment systems. The WorldKey Loyalty is a new online solution that allows vending operators to communicate directly with their customers and develop loyalty programs. Traditionally, operators have little information on people who use vending machines. WorldKey Loyalty offers, for the first time, a way to learn behaviors and habits of end users and plan one-to-one campaigns via email. The results are increased turnover and more satisfied customers through customized promotions. "It is an honor to be nominated again this year at the Vendies," explains Nick Norris, UK and Ireland Sales Manager. "It is a fitting reward for our continued focus on bringing innovation to the vending market from which both operators and end users can profit." Carles Alexaindre, Executive Vice President and General Manager of Global Vending, adds, "This is a great team effort and shows yet again how well positioned we are to support vending manufacturers and operators with cash and cashless payment systems." The Vendies winners will be announced during a ceremony at the Millennium Gloucester Hotel in London on Wednesday, June 28th. SUZOHAPP is a global provider of high quality products for banknote handling and, at Expojoc, visitors will learn more about the features and benefits of these solutions. The Bill-to-Bill 300 banknote recycler is extremely popular in Spain, given its ability to recycle up to 300 notes in three different denominations. SUZOHAPP also has a strong reputation for coin handling expertise, thanks to the Comestero coin validators (RM5 HD) and the coin pay-out devices (Evolution, Cube and Flow hoppers). Furthermore, SUZOHAPP is the expert for coin recycling with the ICS (Intelligent Coin System), a revolutionary new coin handling device that counts coins and separates them into eight separate tubes for coin return. The SUZOHAPP offering also includes technologically advanced products, such as the SCAN COIN banknote and coin counters / sorters, the CashComplete? cash management solutions and the Comestero changers. Finally, SUZOHAPP is well known as the master distributor for leading component manufacturers, as well as ELO touchscreens and TransAct printers. "The Expojoc is a perfect networking event for us. We are pleased to support local exhibitions and show our dedication to the Spanish gaming market,?" explained Sergio Pérez, Sales Representative for SUZOHAPP Spain. "SUZOHAPP is the one-stop shop for both operators and manufacturers ? we can meet all their needs. Come visit us and discover how our solutions can support and improve your business," concluded Juan Gomez, Managing Director of SUZOHAPP in Spain. The conference is organized by ATMIA, the trade association representing the entire global ATM industry, bringing together more than 600 banks, network processors, vendors and service providers at one event. This year the conference commemorates the 50th anniversary of the ATM and the 20th anniversary of ATMIA and will cover innovation in relation to ATMs, cash, self-service, branch transformation and multi-channel customer service. Walter ter Rahe, Vice President of Sales Banking EMEA for SUZOHAPP, will present &apos;The Importance of Coin Recycling&apos; (Stream 1 - The Cash Cycle; 17:10 ? 17:30) as a conference speaker on the opening day. The focus will be on current and new concepts for Banks and Cash in Transit (CIT) companies. "I will highlight a project with the Singapore Mint, bring you pilot feedback from a coin recycling project with the BNPP in France and include some cash recycling facts from the retail industry," explains Mr. ter Rahe.